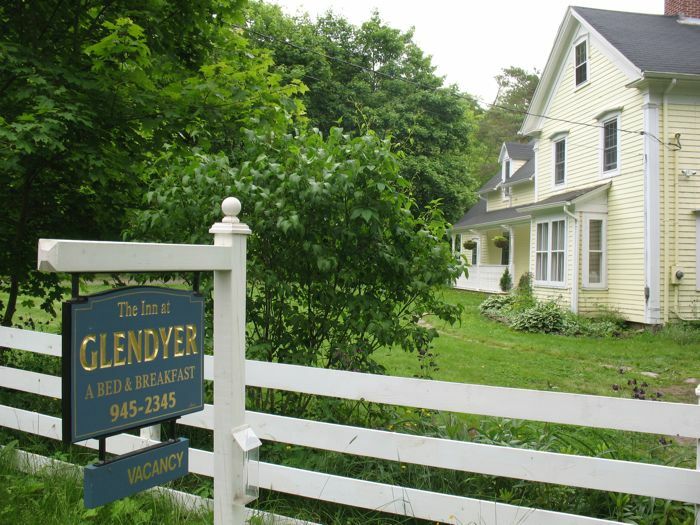 This morning, during breakfast while chatting with our innkeeper and fellow residents, we learned that there is an annual festival here in Mabou called Celtic Colors, and that the Glendyer Inn is always booked up solid for that time, as there are not many rooms available in this area. I thought it would be something I would like to come to, so put it on The List. So often when we travel we haven’t the time to linger, to really spend the days we want to in a certain place, so I have this imaginary list with more than a few locales to return to. 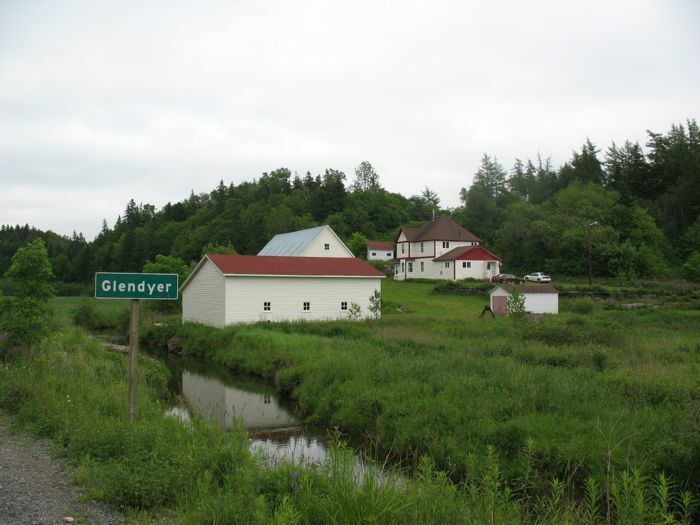 Mabou, the music and Glendyer Inn have a spot there. 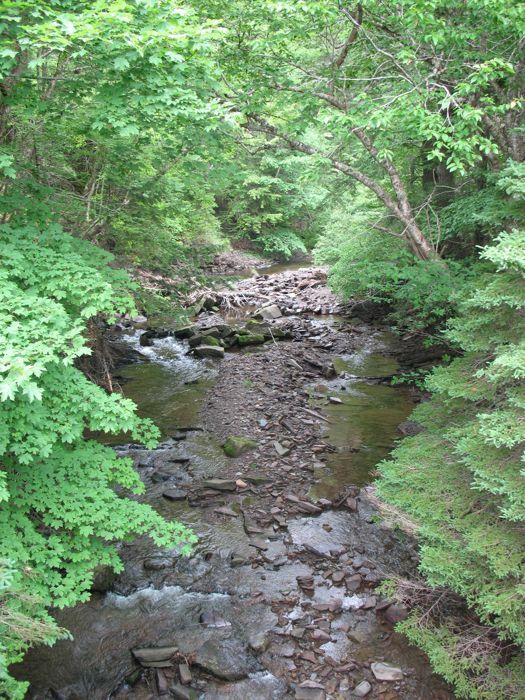 Next to Glendyer Inn is a small millstream, for that’s what used to be around here: a mill. So there’s also a defunct railroad trestle, that another day would make a nice walk (but, oh!, the mosquitos!). 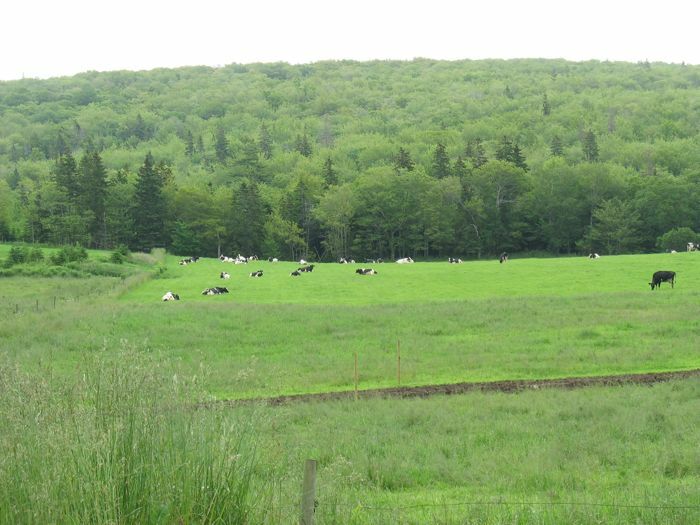 We turned UP the Inn road, instead of down towards Mabou. 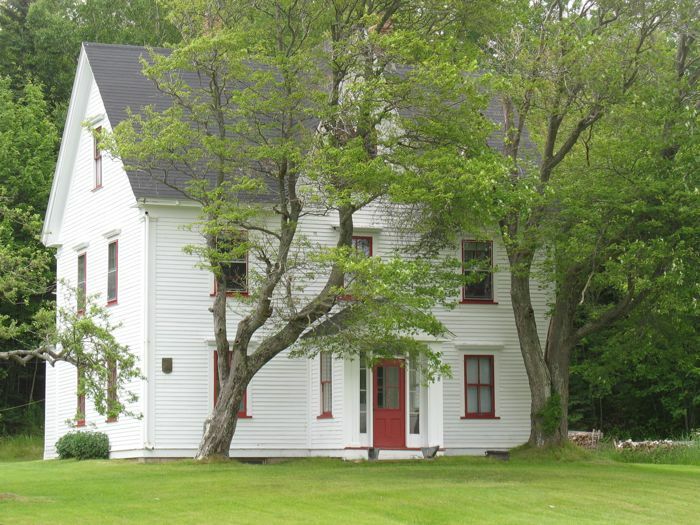 The innkeeper said that some of those who had stayed with her ended up buying property around here for summer homes. I can see why. Red and white house sighting! 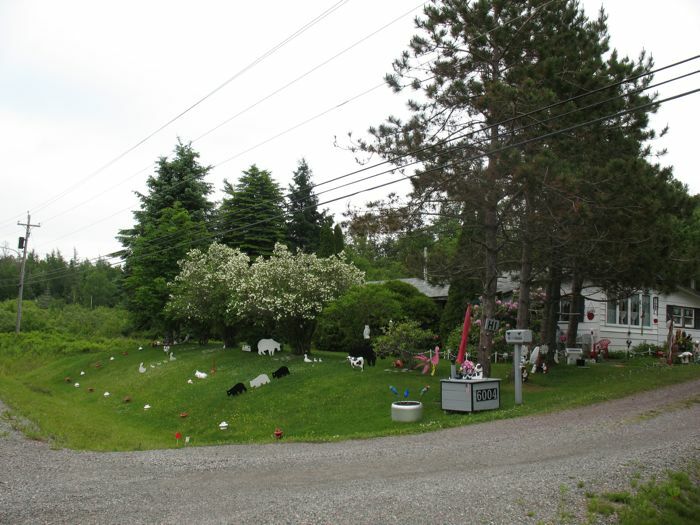 We did happen onto some spectacular yard art as we traveled, but this one, laid out in a pattern with all sorts of animals and strange treasures was memorable. 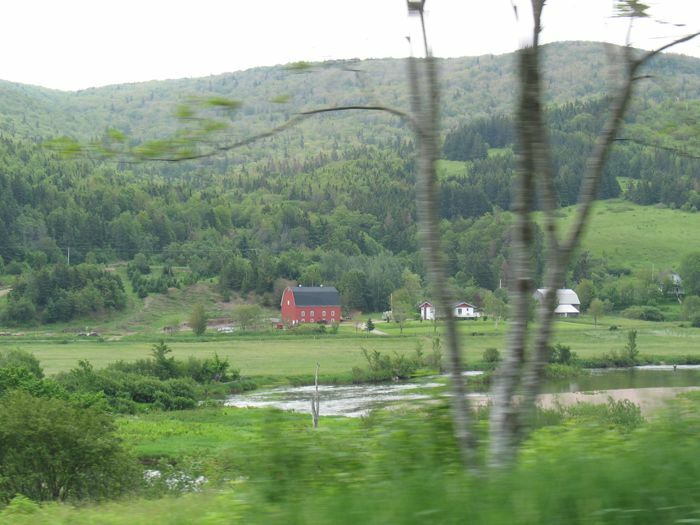 I guess the red house caught my eye because it stood out in the green fields and forests. 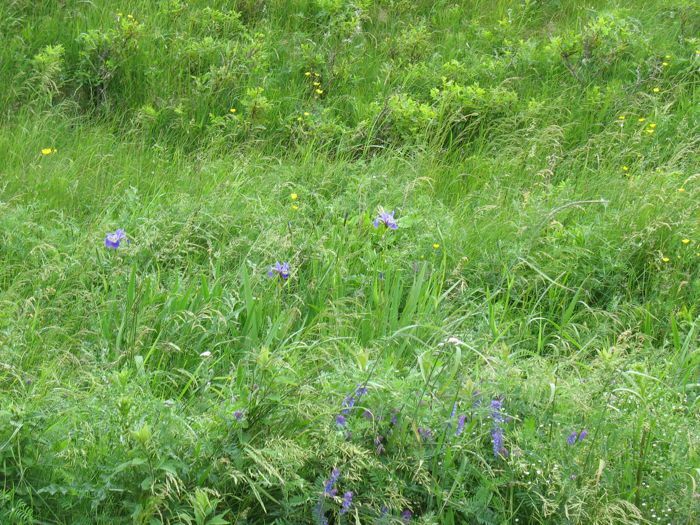 Wild irises on Highway 19, Cape Breton Island. 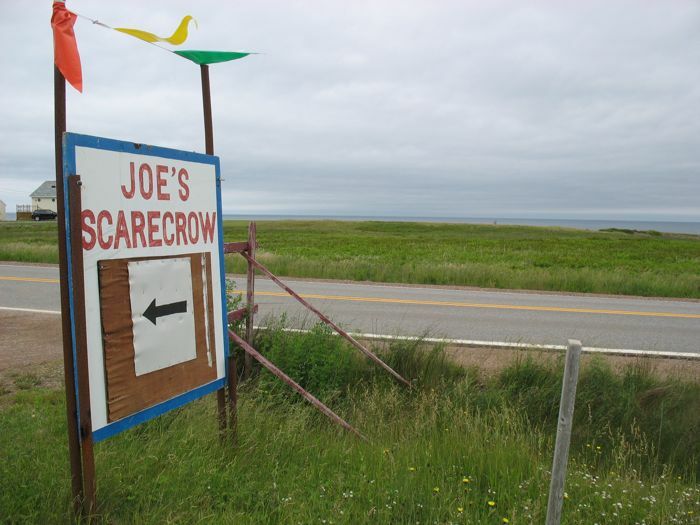 Our innkeeper had told us about Joe’s Scarecrow farm, and I immediately recognized it, not from this sign, but from the obvious combination of naive art and just plain weirdness. 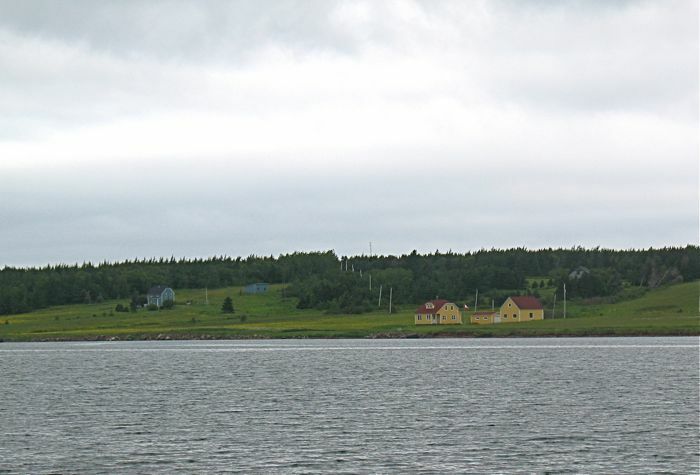 It is just south of Cheticamp by about 20 minutes, near Cap Le Moine, if you go looking for it. Dave said “Pass” and he spent his time taking photos of the local houses and flora and fauna until I could coax him to play along with this weird vision and pose by a scarecrow. This is the welcome scarecrow: a figure made up of halloweeny mask, scavenged clothes, gloves, hats and other stuff. 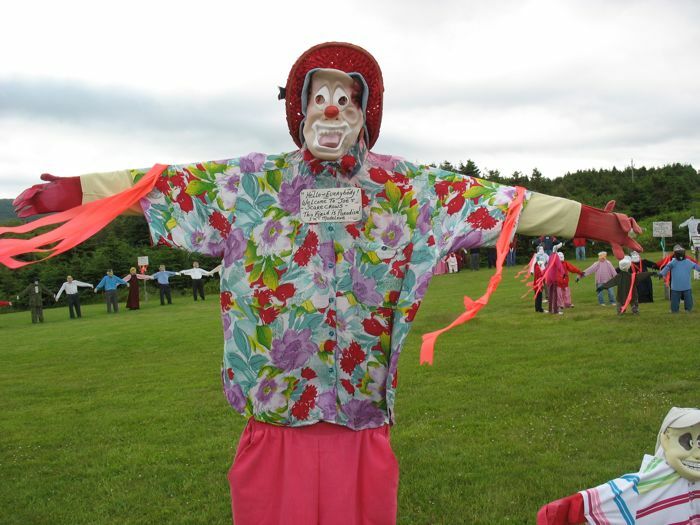 The rest of them stand in a semi-circle radiating out from this greeter, and also include a smaller circle of “children” scarecrows. 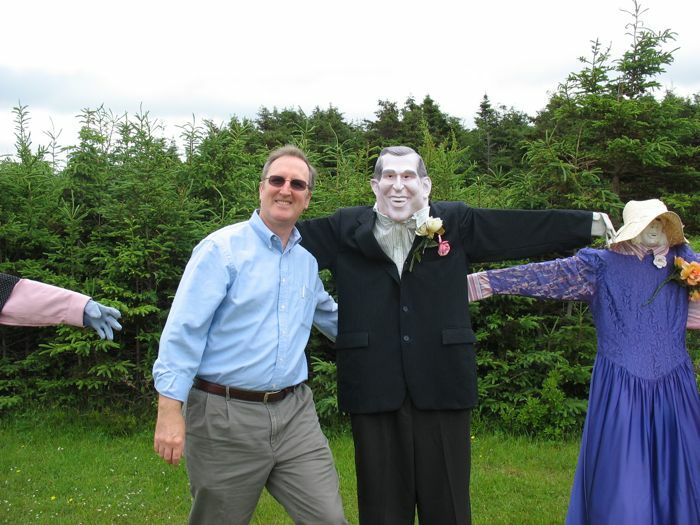 As a Democrat, Dave posed with one of the scarier figures there: George W. Bush. In 1946, Joe Delaney planted a garden and placed scarecrows in it – to scare away the crows. Neighbors told Joe the garden was too close to salty sea water to grow vegetables while other neighbors suggested he grow scarecrows. He placed more scarecrows in his garden and tourists stopped to see the figures so he planted even more scarecrows. A few years back vandals destroyed all of the scarecrows except one and the local newspaper wrote a story from the lone scarecrow’s point of view. 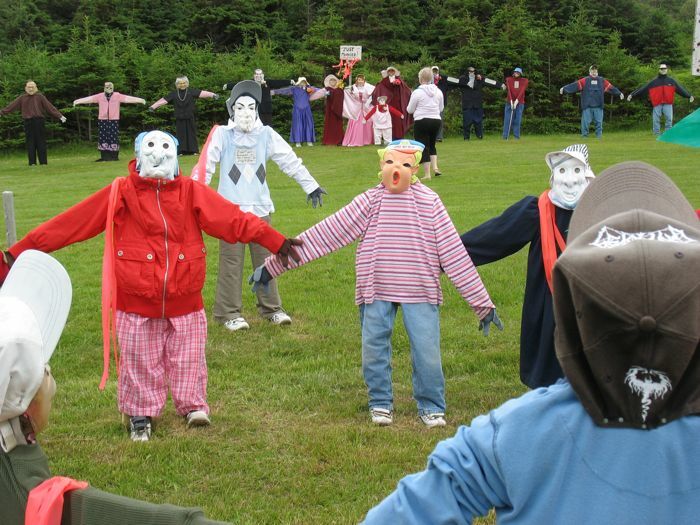 People from Cape Breton, Nova Scotia and even from around the world came to Joe’s support and donated clothing, materials and money to rebuild his scarecrow collection. 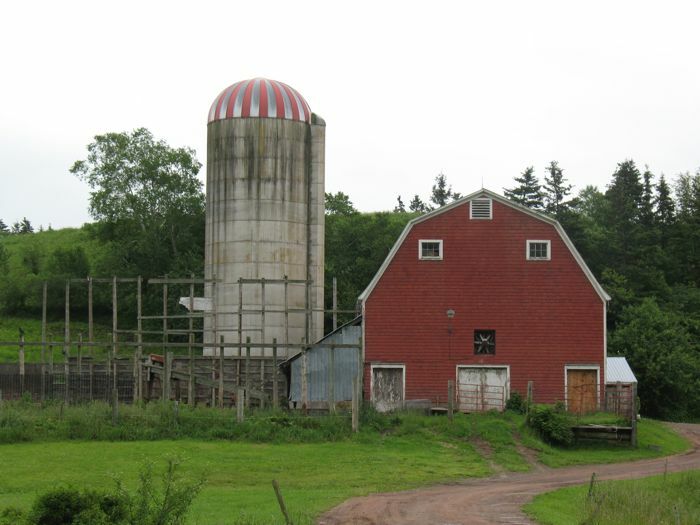 So, why the red, white and blue barn, with a yellow star? Is someone from the States, and broadcasting it loud and proud? 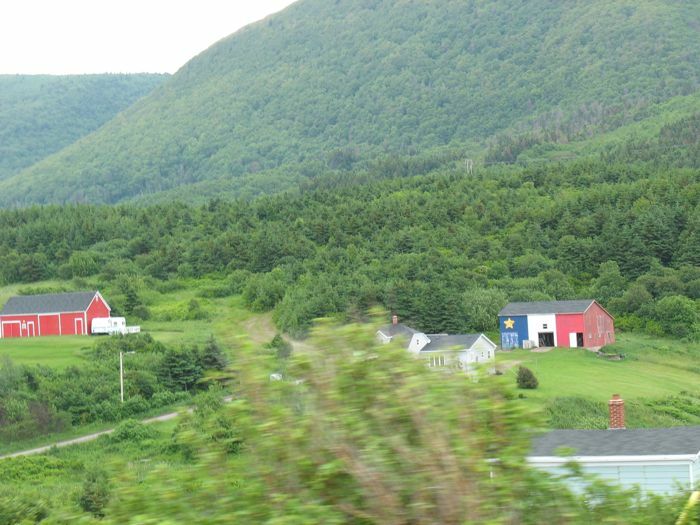 No, we’ve just entered Acadian Country, and those are their colors. I know, you’re thinking, “Great shot. Not,” and I’d be inclined to agree with the idea that there isn’t much to photograph around here on a foggy gray day. So this shot (which I thought Dave did a fine job snapping) is typical of the lone house surrounded by either water or green fields or forests or some combination of all three. 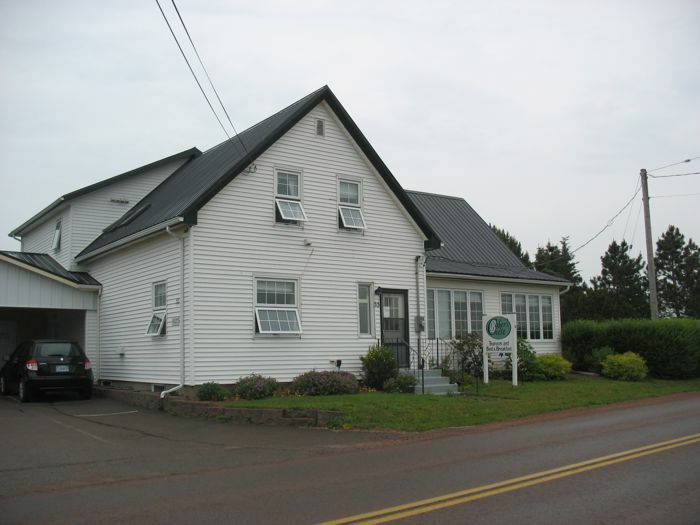 Even the village of Mabou, which we liked quite well, is tiny–a long street with two restaurants, a quilt shop, a government building, gas station and a church or two. 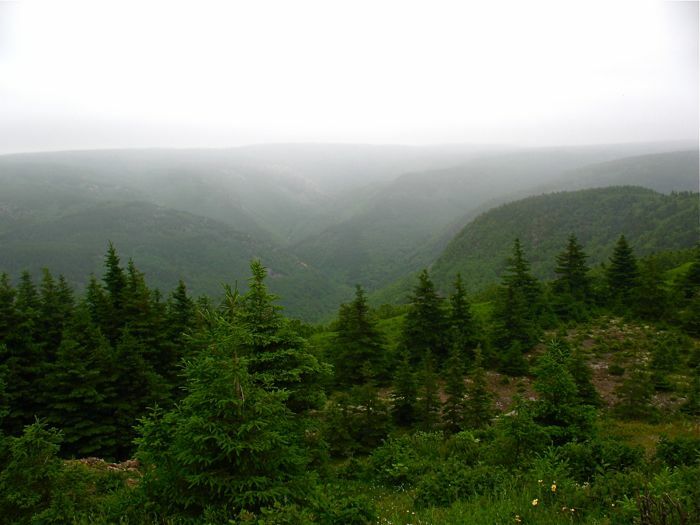 It’s the smallness of civilization that I think represents Cape Breton Island–Man has not left a large mark on the terrain. I was also always aware that in winter, this might possibly be a tough place to acclimate to, given the winds and water and cold, and a video I found of crossing the Canso Causeway in a blizzard confirmed that for me. This trip was a bit of a different journey for us, and we knew it wouldn’t have the easy showiness of say, the hilltowns of Italy, or Paris, France. It’s not “easy” touristing, with a picture around every corner and familiar landmark on the next block. The distances are lengthy, the food is mostly “eh,” the giftshops filled with medium junk from China mixed in with maple sugar, maple syrup, tartans and postcards. Where there are local crafts (like in the Acadian museum near the church) I found the prices to be more than I was willing to pay, for what would I do with a hand-hooked wool coaster for $12 ? (Although I must say the hand-hooked wool rugs for $800 were small, but beautiful.) We learned to dial down our expectations from European travel and enjoy the small pleasures we found–like a yellow house with a red roof across the water. 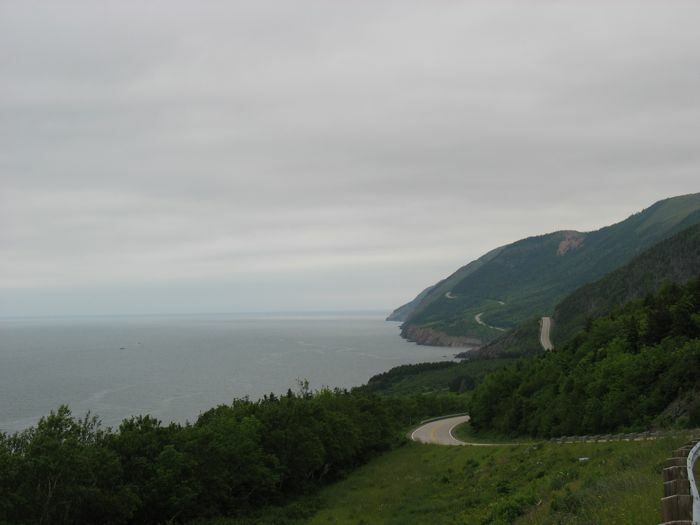 Our goal today was to drive the Cabot Trail, a road through the Cape Breton Highlands Nation Park of Canada, looping around the upper island with many views of the ocean.. The day is still a little foggy, not brilliant sun like we’d hoped. But in travel, you take what you can get. And we took in all the vistas, and enjoyed the scenery, except when we were behind what Dave referred to as a Winnebagah, which actually turned out not to be too often. 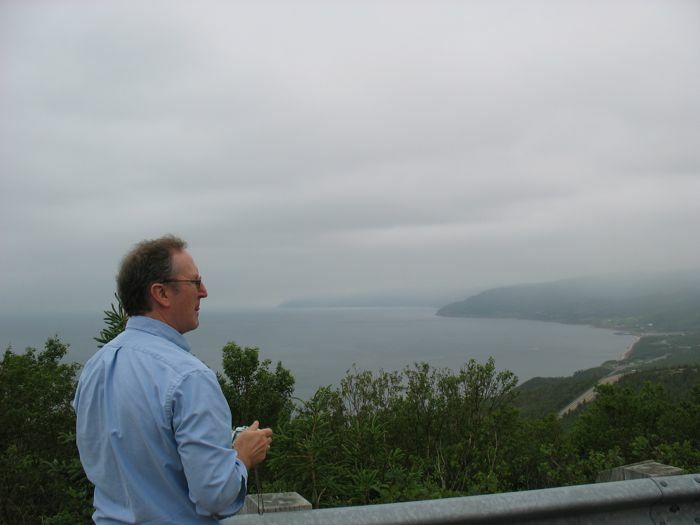 The beginning of the Cabot Trail, for us, was here, when we glimpse out from the Cape Breton Highlands down to the ocean. 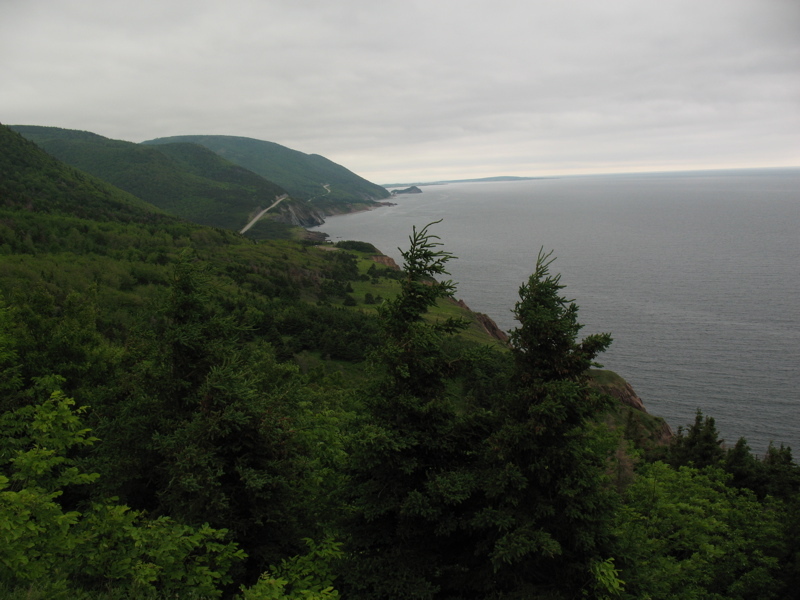 The Cape Breton Highlands National Park of Canada, reminded us of Big Sur, Maine, Zion, Yosemite, parts of Big Bear and Germany all in one. It was beautiful. 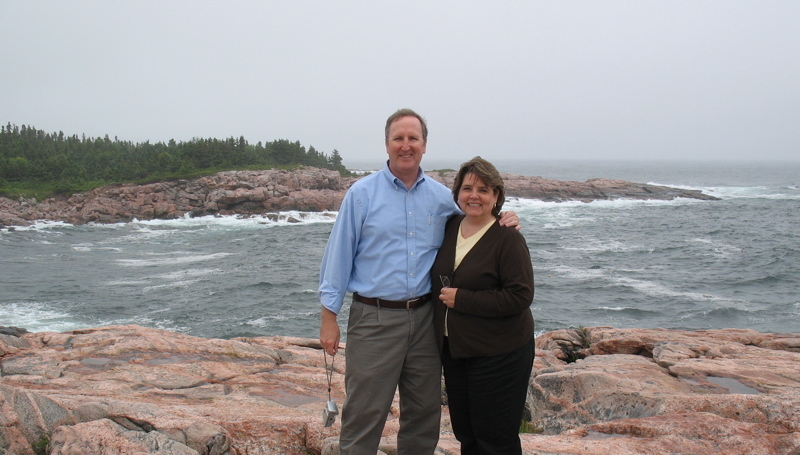 Notwithstanding the description of the trip in the above section, my main goal on this trip was to spend time with Dave, as we celebrate our 21 years of marriage this coming August. We talked often (the car, without radio or iPod hook-up) provides lots of opportunity for that, and I enjoyed our conversations. 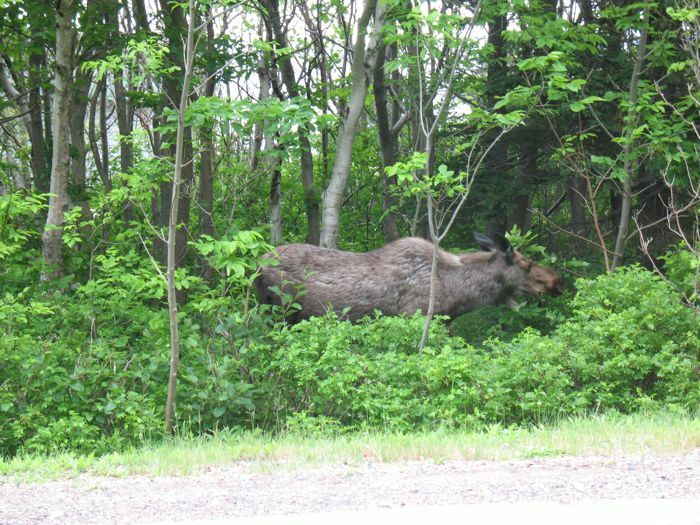 Moose! She was with her calf, so we kept our distance. We could have taken the nine kilometer hike down to the water, but we didn’t. This is an inland valley. We know this park would have been more dramatic in the sun, but I didn’t mind the misty softened edges, and the quiet that the fog brings. We learned to stop at pull-outs especially if there were other cars already stopped. From a postcard, sold everywhere, that shows the road coming down MacKenzie Mountain (which I’m pretty sure is the mountain in the inland valley, above). 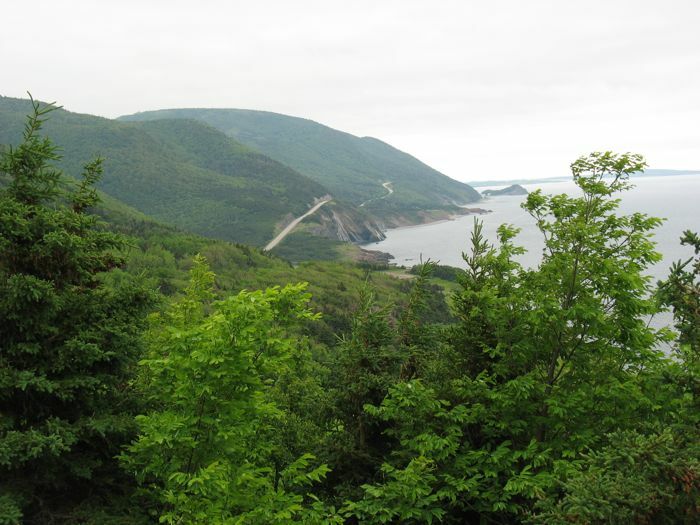 This is on the eastern side of the Cabot Trail, probably few minutes south of Nells Harbour. We see the water again. 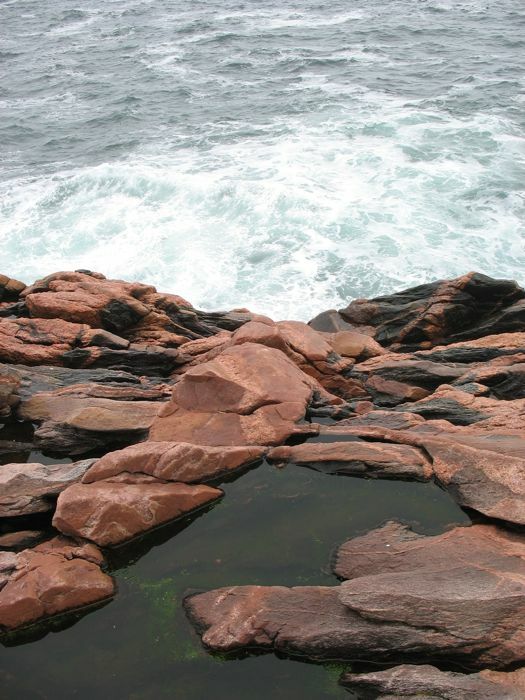 We stopped here with two other Winnebagahs (Winnebagos) to take in the crashing surf on the red rocks. 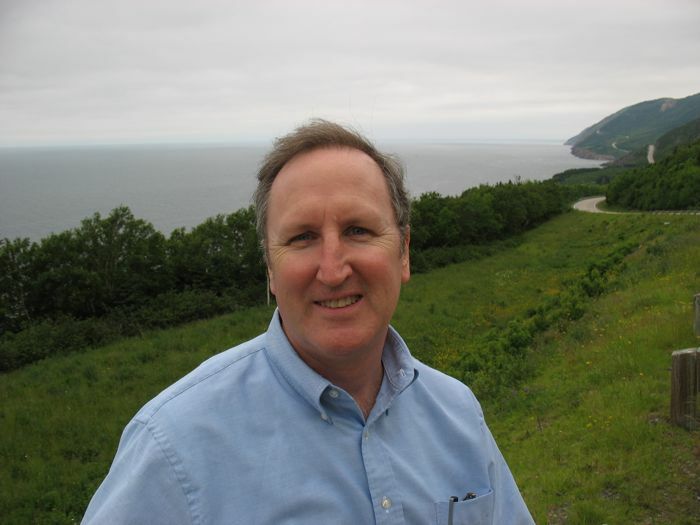 Dave noted that while the water on the western side of Cape Breton was placid, this eastern side was like the typical ocean, with lots of wave action. We chatted briefly with one tourist couple from Hamburg, Germany. They’d parked their camper up at Cape North the night before and in the morning awoke to the sounds of barking seals in the ocean below. Note to self: add this to The List. Because my favorite thing is to get a photo with Dave, they politely snapped our photo. I couldn’t believe how many lobster traps there were in this surf. 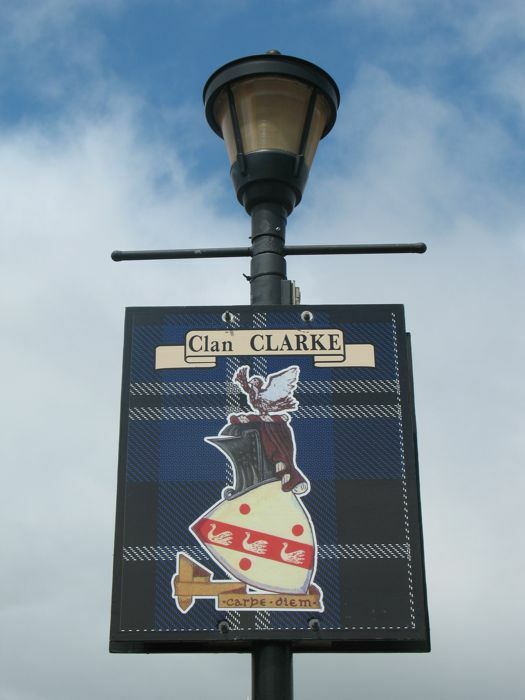 Apparently those who wish to place a trap have to register with the Powers That Be, and each fisherman has their own decorative buoy marking the trap–each different, each unique. 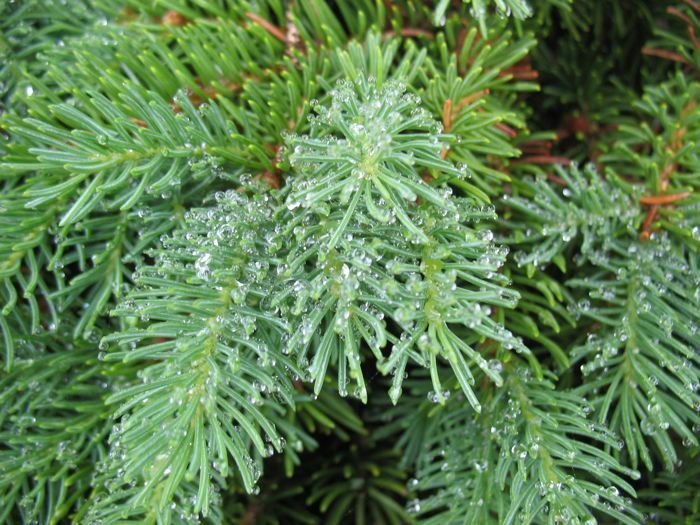 The sea mist has been trapped on the spiky green pine needles at Green Cove. On the eastern side, there are a lot more crafts people with little shops. We lots of signs for quilts, sweaters, pottery and woodworking. 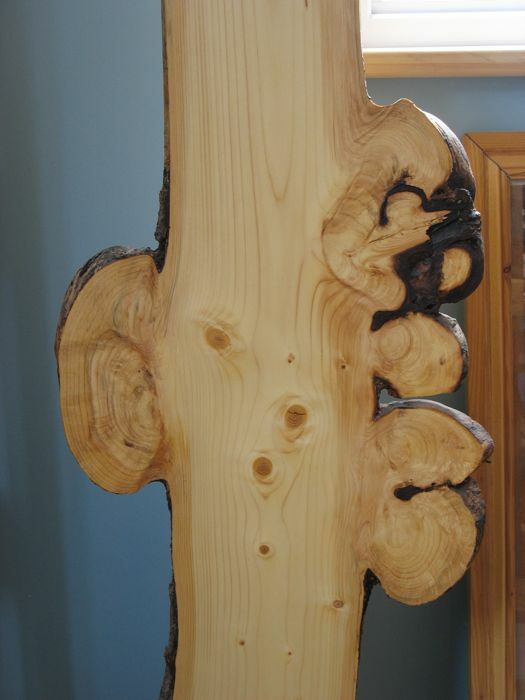 We stopped at this woodworking shop and enjoyed the long thin slice of a log, showing the knots of the tree trunk. We also stopped at another place, where we bought a CD of Cape Breton Fiddle Music from the Lighthouse Fiddler. 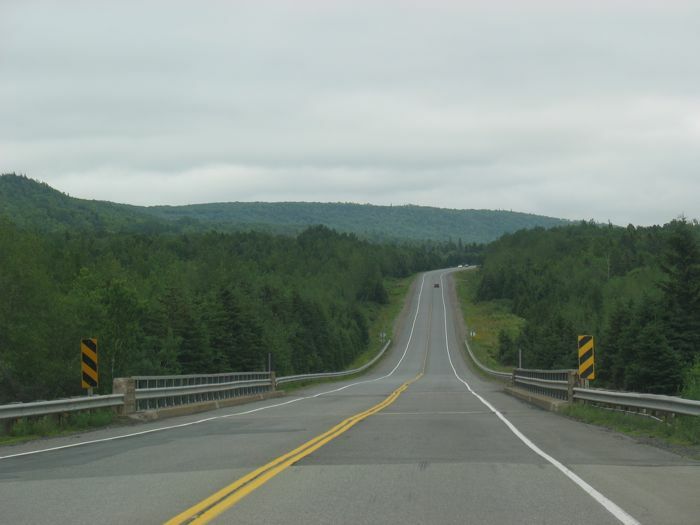 We popped that into the CD slot in our car and listened to the vibrant tunes and we drove towards our next stop: Baddeck. 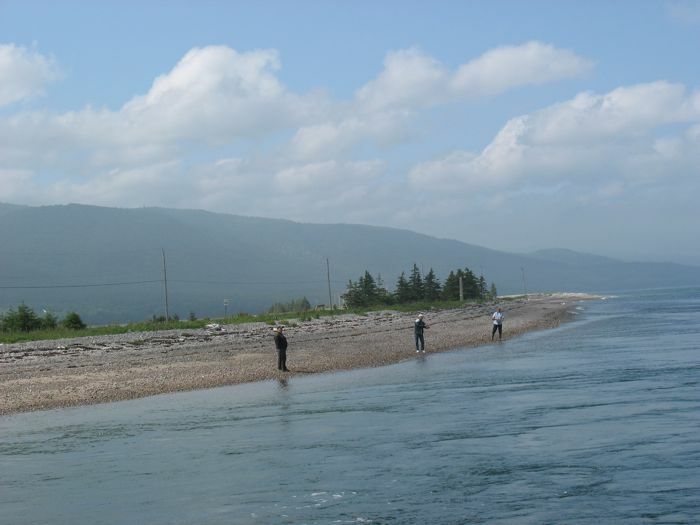 We took a turn away from the Cabot Trail and headed toward St. Anne’s Bay in order to take a ferry across that harbour, shortening our drive. We were a little tired of being the car by this point. I looked back behind me as the ferry went quickly across the water and bid a good-bye to the highlands. 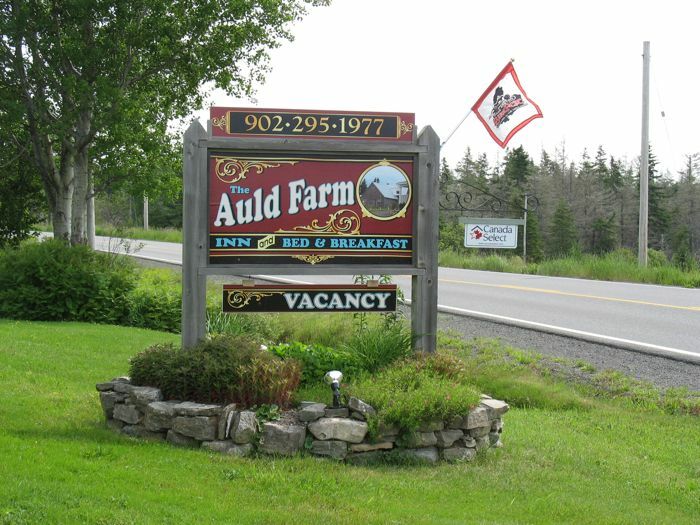 Into the car again, and within a half an hour had arrived at our Bed and Breakfast: Auld Farm Inn. 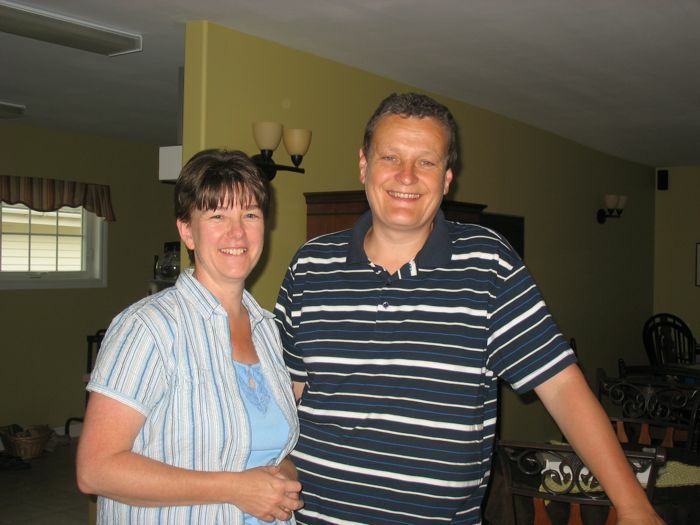 It is run by a couple from Scotland who two years ago (all together now) got tired of the rat race and decided to immigrate to Canada and run a bed and breakfast. This place was more like a small inn, as it had nine rooms, some in an addition to the back (where our room was). 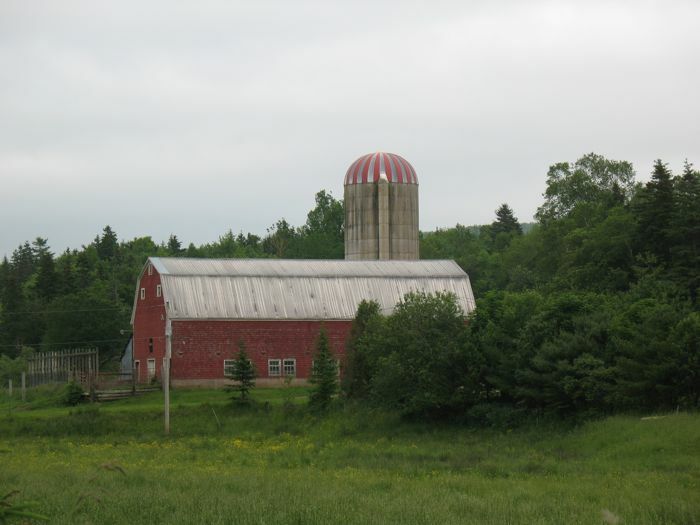 This really was an old farm at one point, with this huge barn dating from the turn of the century (according to him) at the back of the property. The owner was still cleaning out the hay from the previous owner. 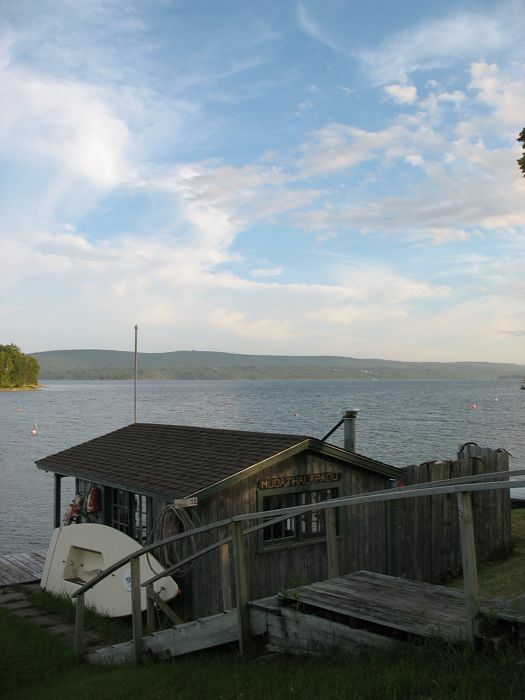 We settled in, got the wireless code, checked emails (Dave had a storm brewing at work that he had to keep tabs on), then headed down to Baddeck. We stopped at the tourist office, who was just closing. The whole place seemed to be in a good mood because the next day was Canada Day, and they’d be closed. I was asked three times if I’d gotten my Canadian pins, and so I obliged, taking enough for the grandchildren, only realizing later that they wouldn’t really be interested. So if you need some Canadian pins, let me know. 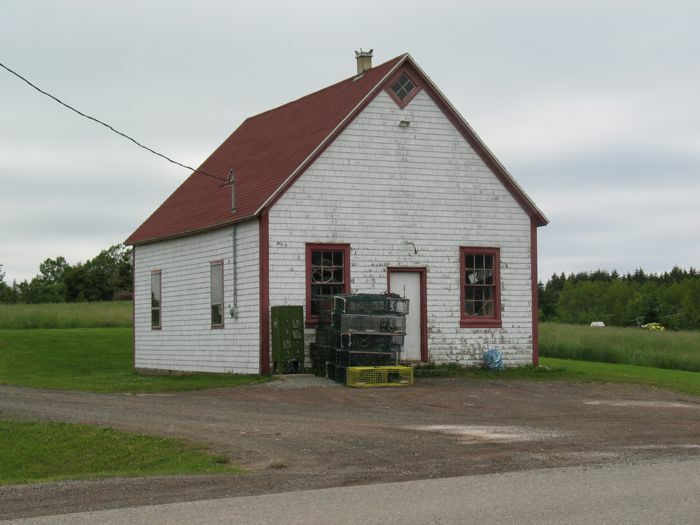 We walked Baddeck, a veritable city to Mabou’s town, as this had two stoplights and two gas stations, among other things. 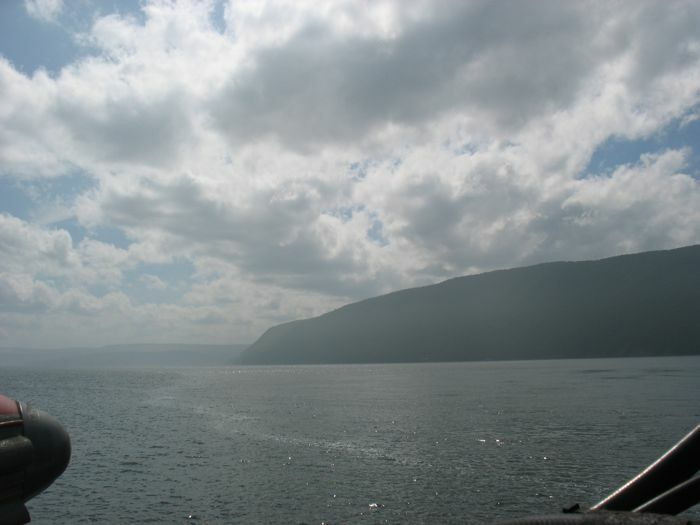 Baddeck is on the shore of the large inland lake called Bras D’Or, named by the early French settlers. It has limited tidal action and an abundance of inflow from local rivers, so the salinity is lower than the Atlantic ocean. 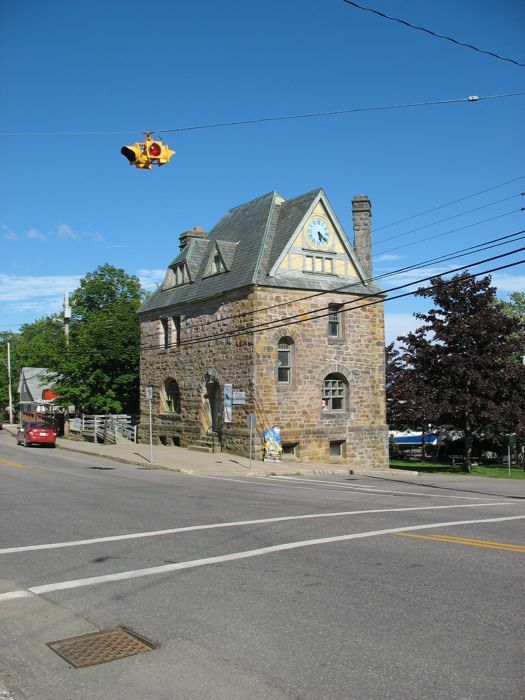 Old building, converted to a museum, and I loved the lone hanging stoplight. We noticed how many wires seem to cross our views this trip, as it seems they don’t bury their electrical lines as much as we in the States do. So these lines become part of the scenery, I guess you could say. Dave and I took a break for a while, gazing at the harbour, sitting on a bench in the shade, for yes, the sun had finally arrived in our trip. 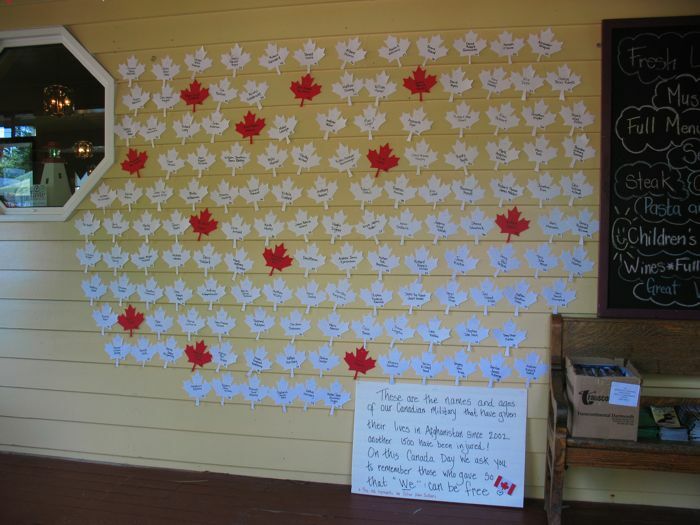 We walked back along the main road, and this wall caught our eye–a leaf for every fallen soldier in Afghanistan since 2002, with the red leaves for “fellow Nova Scotians.” We attributed this show of patriotism to the upcoming Canada Day, but did reflect on how little we note the fallen soldiers in our own home town. You’d NEVER see this kind of a display at the local sandwich shop, for example. Does our reticence linger from the Bush year doctrine of not mentioning those who were killed, the photographs of the soldiers’ coffins forbidden? Or does it stem from the United States’ divided attitudes toward the war: we realize that we need to stand against terrorism, but just wish we didn’t have to fight two wars in order to do it. Whatever the reason, I found the Canadians’ attitude toward these wars to be somewhat of a mystery to me–acceptance, perhaps, of the role their neighbor to the south has always played in their lives? One man we met went out of his way to tell us that while he’d heard many negative things about Americans, all of the people he’d met from the States had been very nice. A curious comment, we thought. 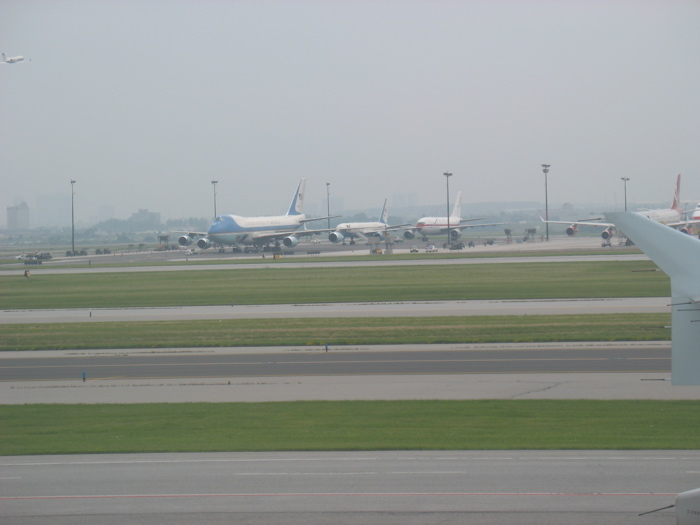 Travel makes me see things I don’t always want to, especially on this trip, where we speak the language and interact more with the residents, our fellow travelers and sight-seers. 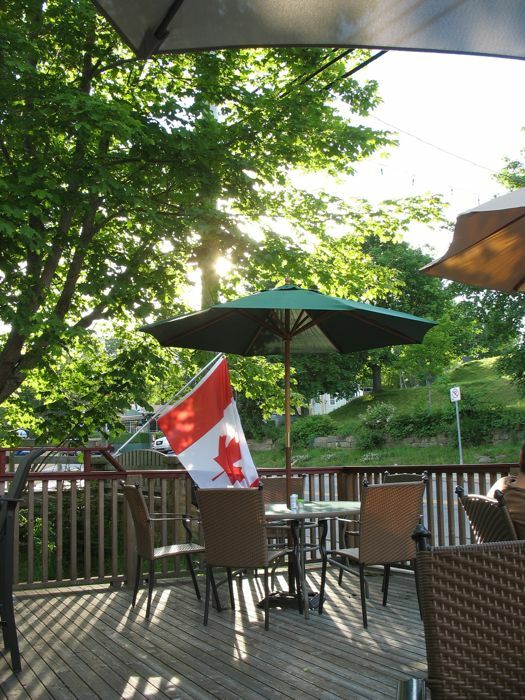 We decide to eat here, forgoing the splashy tourist brochure ad for another place in town that serves Lobster Dinners (we don’t really want the mussels anyway–even if they are “all you can eat”). 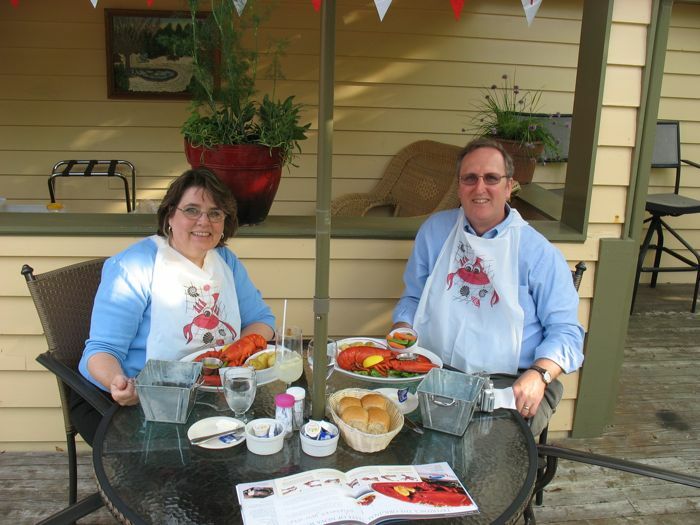 The meal consisted of lobster, homemade rolls, roasted potatoes, home-style lemonade. 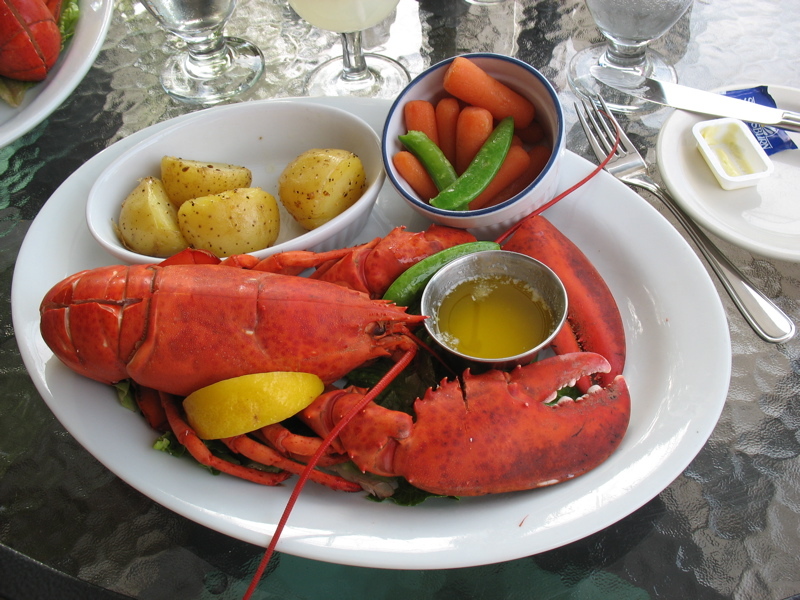 That lobster looks kind of territorial about the melted butter, doesn’t he? I’ll post a description of our dessert on another post a little later, a dessert which we shared. Because we were full. But, boy, was it good. We ate on the patio, on this lovely evening. After dinner we took a stroll around town. The waiter had told us about this large yacht belonging to some Famous Person (he’d heard rumors of whose it was); it had broken down and been there for more than a week. 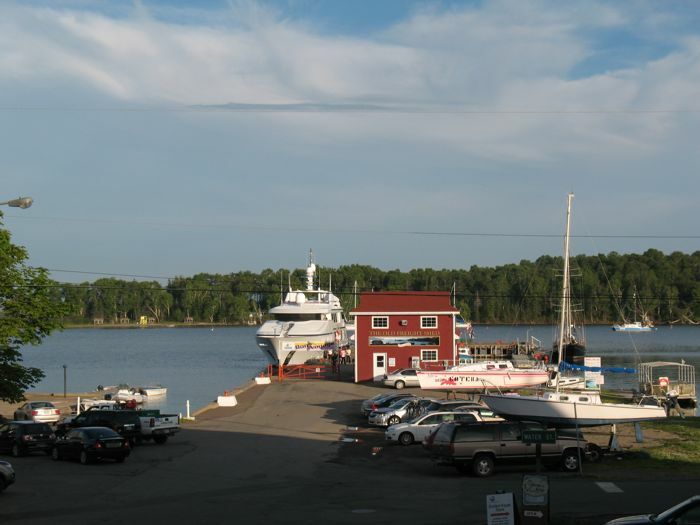 That sounds like the Big Event of the season for Baddeck. But I did see lots of bunting and notices for the parade down main street the next day at 1 p.m. so the broken Famous Person’s Yacht can’t be the only game in town this week. 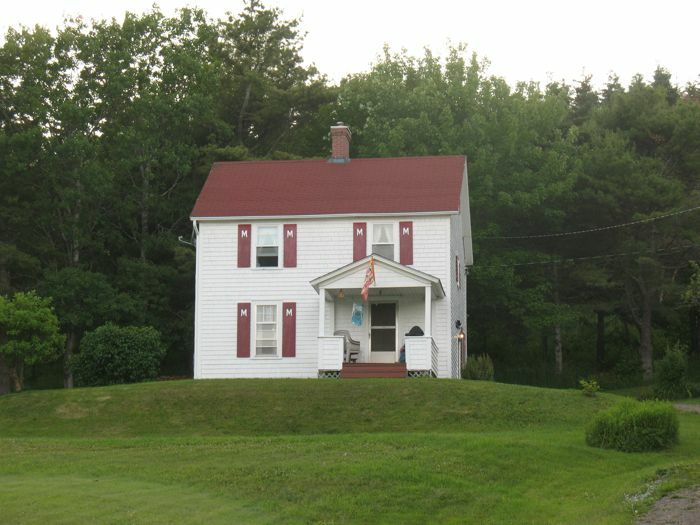 We found Baddeck’s red and white house, complete with golden maple leaves painted on the shutters. We found our car and headed home, taking a detour to see this golden-doored church, and another red and white house (below). We fought our way through the swarms of mosquitoes to our room, but I just had to step out again to catch this sunset. I then flailed my way back into the room, Dave laughing at my antics. Mosquitoes LOVE me. We left Prince Edward Island this morning, kind of happy to be going on to the next part of our journey. Whether it was because of the constant rain, the night’s lodging (Dave called it our Hotel California, if you get our drift) or the meal from the night before, we escaped the fictive Green Gables narrative and the failing local economy and enjoyed the boat ride over: the white accouterments of the ship against the gray sky were soothing. 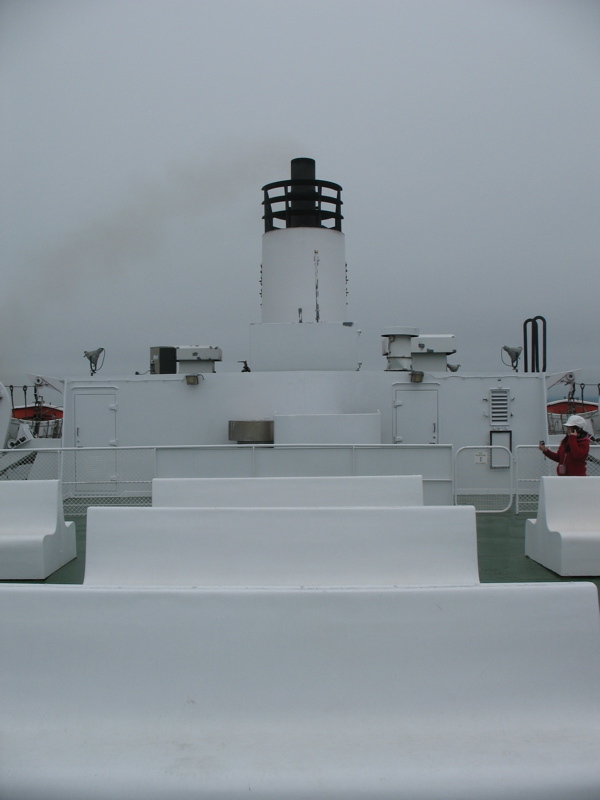 See this post for more ferry shots. 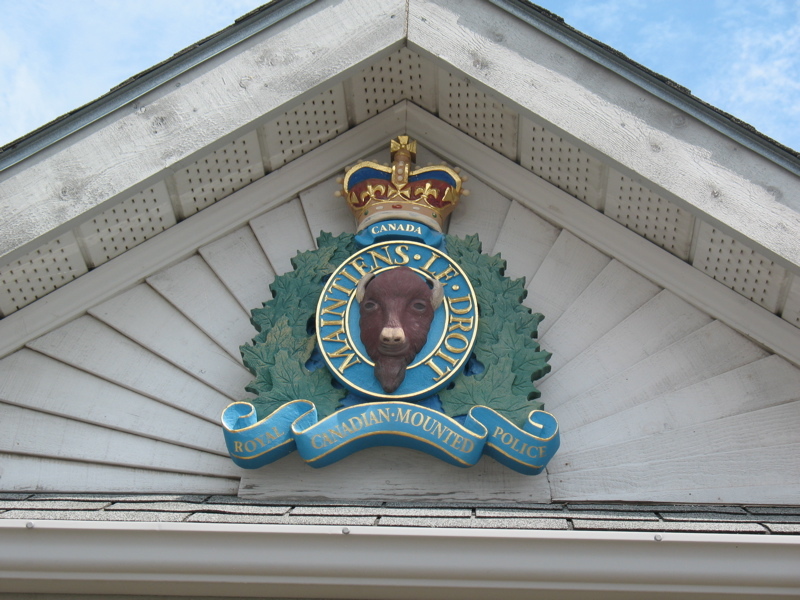 Dave snapped this when we stopped in Pictou for a walk around in the sun, the logo over the local Royal Canadian Mounter Police. And then. . . WE SAW SUN! We were so excited, we decided to get out of the car and walk around a little bit. 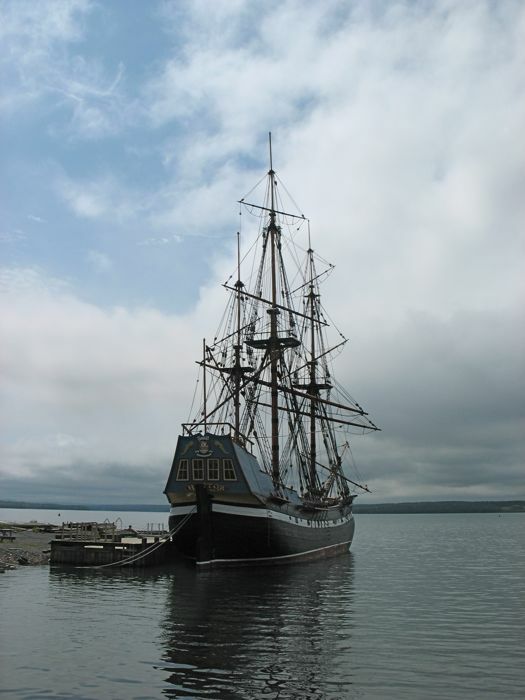 This tall ship is a replica of the one that brought the first Scottish settlers here to Nova Scotia, which, by the way, means “New Scotland.” These new immigrants arrived in September of 1773. That’s just three years before our Declaration of Independence was signed. 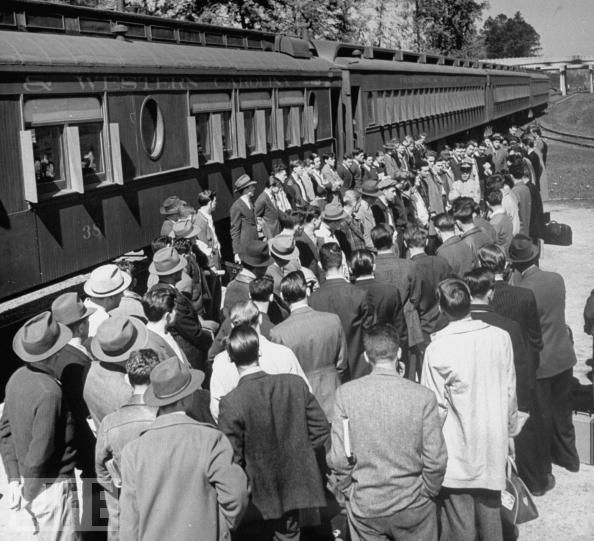 It’s strange to think of these parallel histories–that of immigrants arriving on separate shores, within such a short time of each other. So often we focus only on our own history. I wondered–as I read the plaque on the giant rock there–what if my Scottish great-grandmother had come here to Pictou, instead of to America? 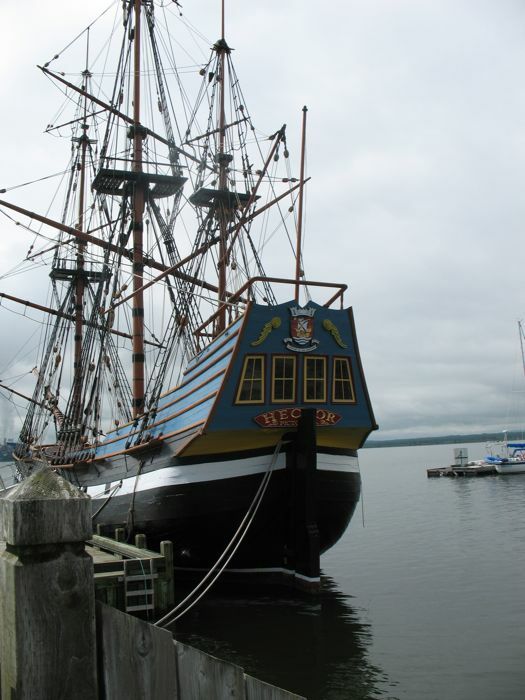 Dave and I would have gone onto this ship, but it’s closed because of local budgets. Given the raft of closures of our state parks, I guess some things are the same everywhere. 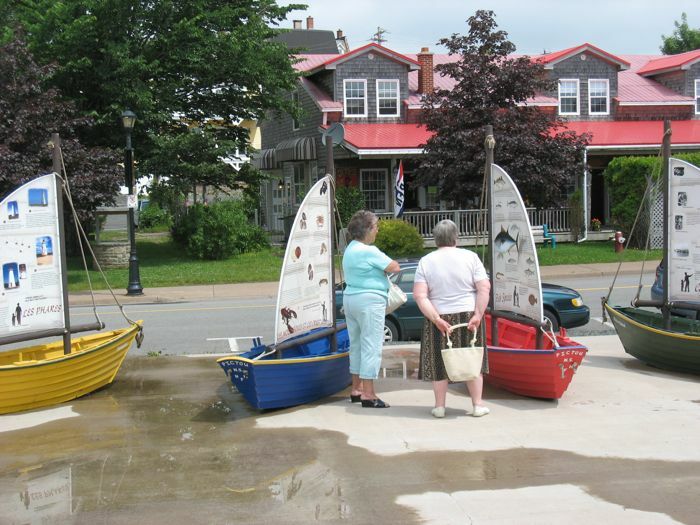 Local tourists at Pictou Harbour waterfront. To emphasize their connection with their homeland, these signs were scattered along the waterfront. Didn’t find my MacArthur sign, though. 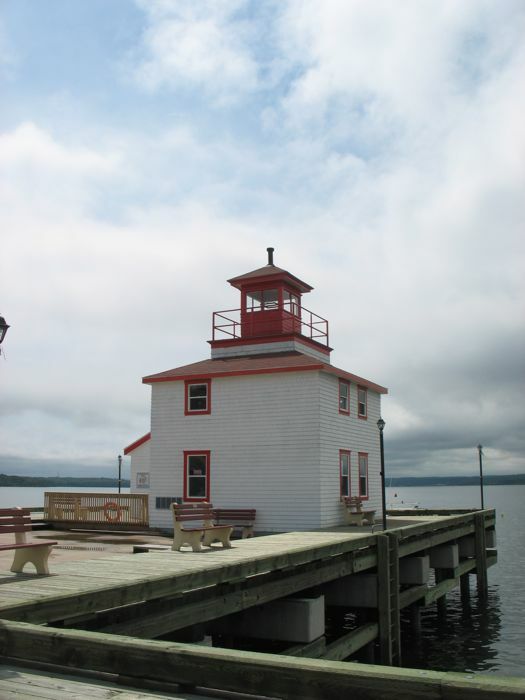 Their lighthouse on the harbour has been turned into a museum. 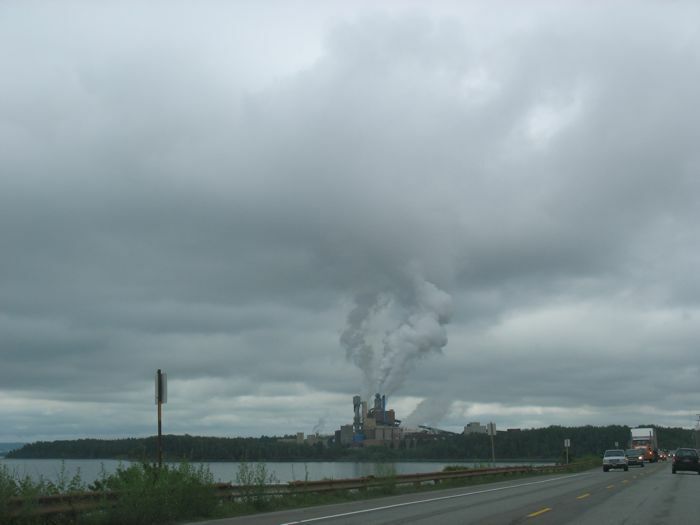 After looking for a lobster roll, but unsuccessfully choosing a spot to linger for lunch, we decided to press on, and glimpsed a bit of Canada’s industry, pollution and all. We traveled Highway 4 east, pressing on to lunch in Antigonish (“auntie-go-NISH”) where we snagged some delicious homemade pizza and cinnamon rolls at the Easting Bread and Honey Company (how can you pass up a place with that name?). We ate it in the car in their teensy parking lot, then got back onto Highway 4 and headed east, then north, over the over the Strait of Canso into Cape Breton. 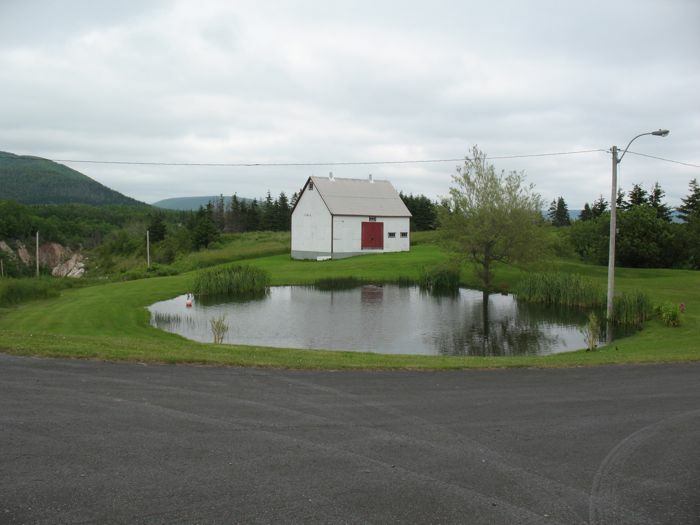 We found the little town of Mabou (“MAH-boo,”on Cape Breton’s Highway 19), smack dab in Celtic Country. 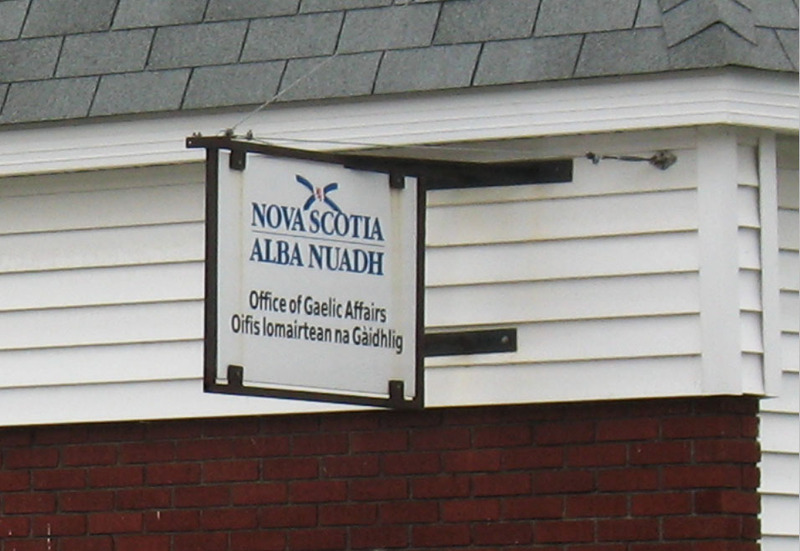 The signs, instead of writing everything in French and English, now were in English and Gaelic, thereby reinforcing the notion that Cape Bretoners, while a part of Nova Scotia, are really apart from Nova Scotia. We decide to explore the little road to the Harbour Mouth, as I’d picked up a brochure for a quilter’s studio to go see (somewhere around here). We never did find here (and after reading about her on the web, I’m really sorry about that), but we did see some different sights. 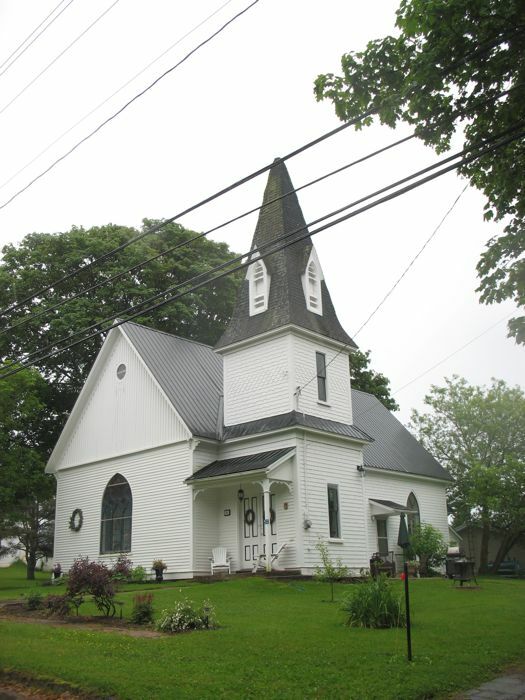 The churches here all remind me of something right out of New England–tall spired, white clapboard buildings, sternly invite the visitor to worship. I enjoyed seeing them all, with their peaked windows. 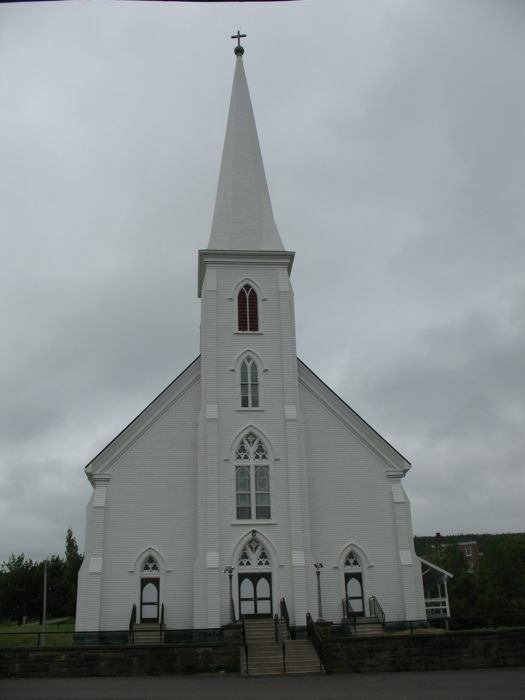 This church’s red window, uppermost in the spire, triggered a spate of “white and red building” sitings. 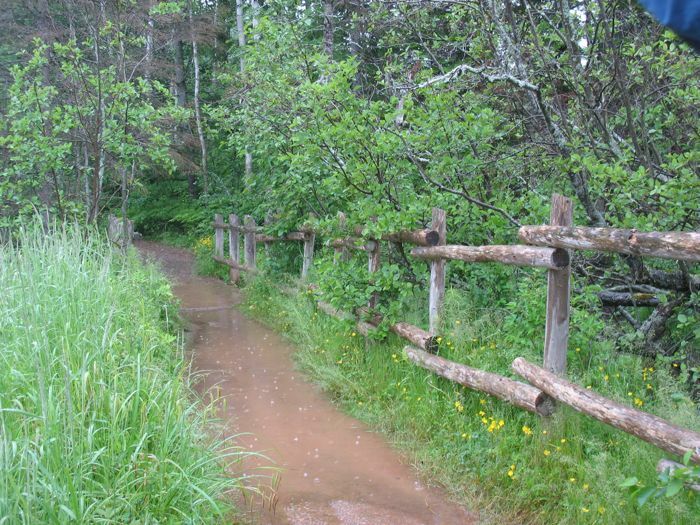 This was just after we turned back onto Mabou Harbour Road from the little rutted road down to the waterfront. I loved the sideways window detail in the eaves. 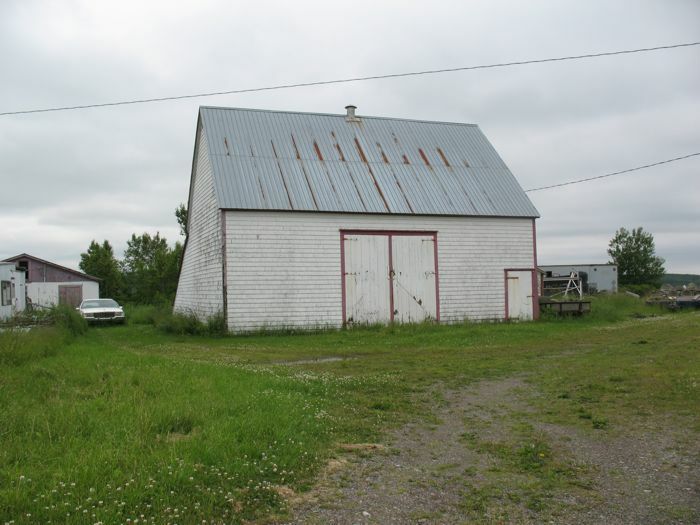 Like a lady fluffing her skirt before she sits down, this barn has a flaring side wall. The red and whites kept coming, even as we headed back into town, then down a side road and up another teensy rocked road en route to our bed and breakfast in Glendyer. 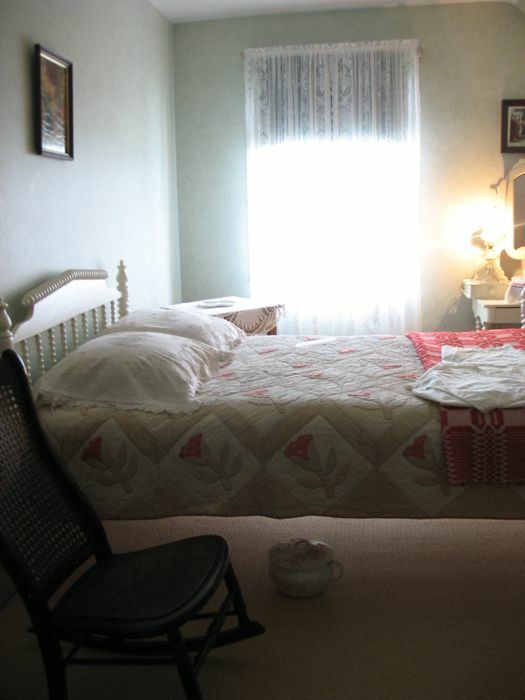 This lovely, perfect, divine bed and breakfast (can you tell I liked it?) is run by an American woman who used to be a corporate lawyer living in Los Gatos. She decided, after her divorce, to leave the rat race (I know you’ve heard that somewhere before) and move to Canada and run this bed and breakfast. She was delightful and I loved her inn. Just before going in, we checked the odometer for the total driving thus far: 733 kilometers. The hallway upstairs, looking out from our room (we had #1). 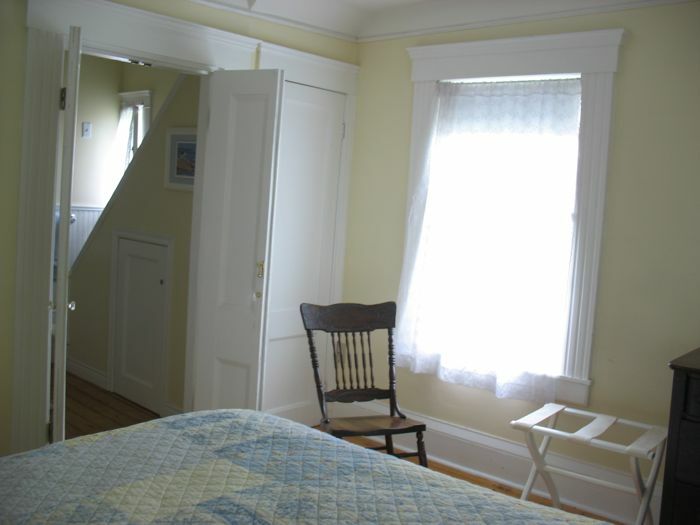 A chair similar to my grandmother Bickmore’s rocking chair–armless, with a spindled back. 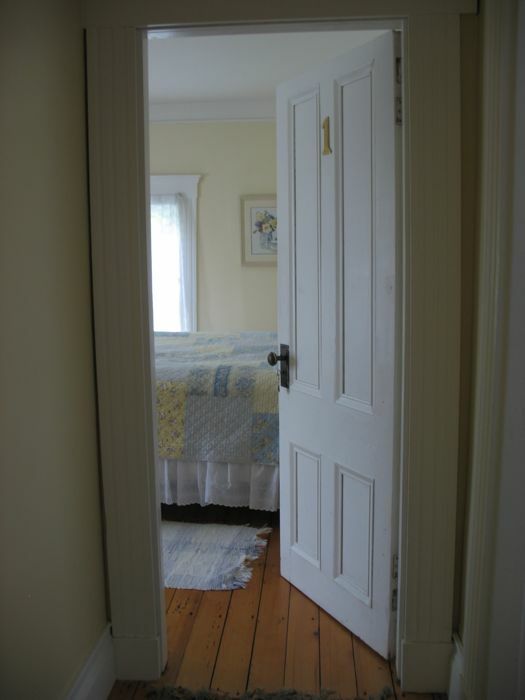 That little room to the left is our bathroom, which used to be a hall landing before the owner renovated it into a bathroom. 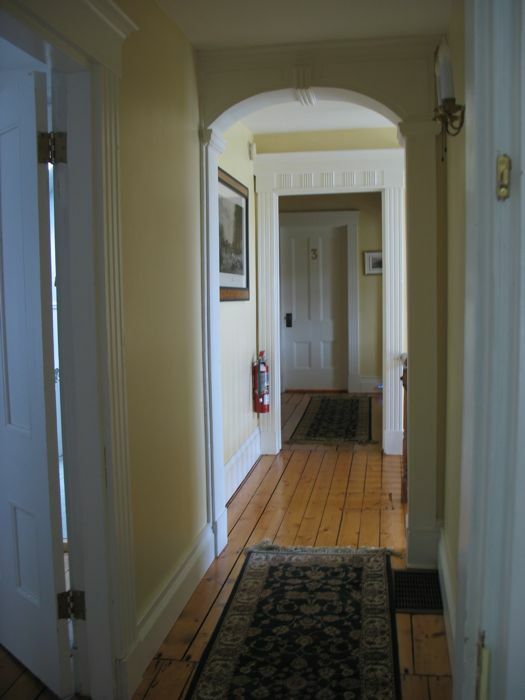 I loved the staircase going up to the third floor (you can just see the angled wall of those stairs) as we used the steps for our toiletries–such a welcome change from the last bed and breakfast where there was no room to put anything. 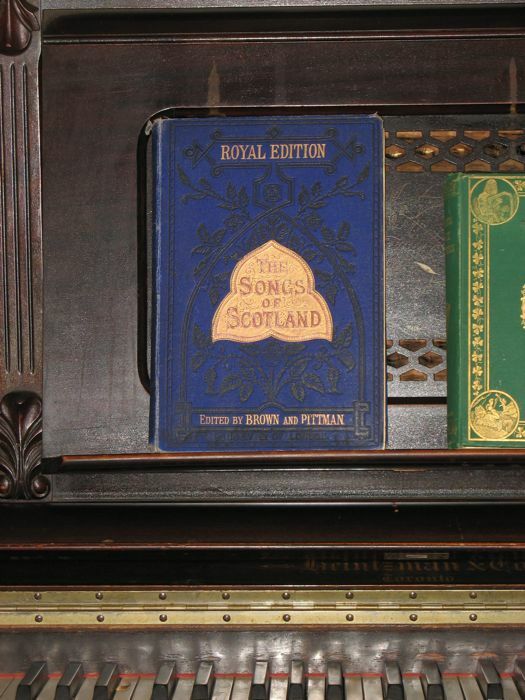 I explored the house (at her invitation) and in the “gathering room,” as she called it, was a piano with this songbook on it. 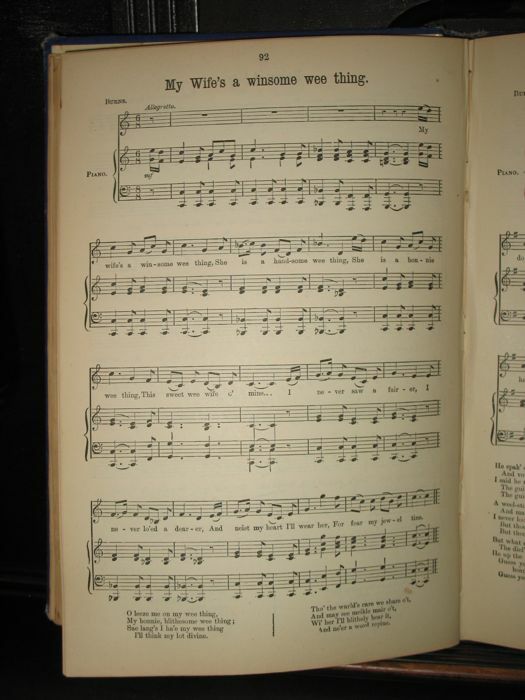 Flipping through it, I found a song that Dave should sing to me every morning: My Wife’s a Winsome Wee Thing. 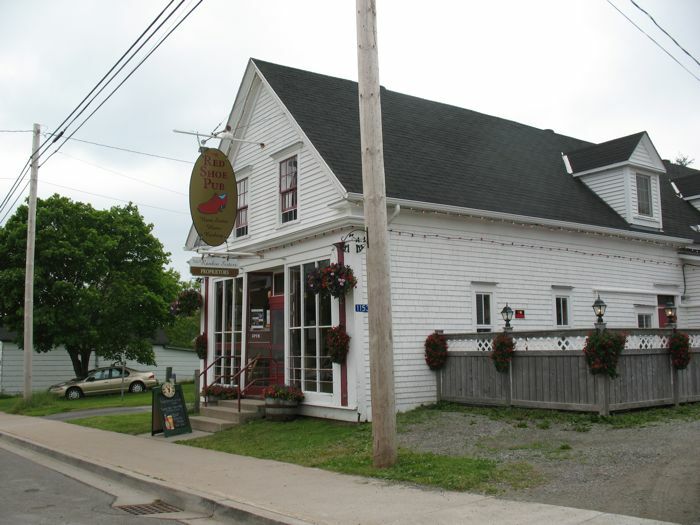 The innkeeper had suggested the Red Shoe Pub in Mabou, run by the Rankin Sisters. At the time I didn’t know anything about the Rankin sisters or their family and its musical legacy, but the special of lobster and asparagus fettucine pulled me in and was incidental to the music that night. Or so I thought initially. Kolten Mac Donnell and his nameless friend on the piano entertained us while I scarfed down the linguini, and soon we began to be pulled into the local flavor of Cape Breton music–a different kind of celtic music than I’d been hearing the states. That music was sort of insipid background music played at craft sales and little boutiques and soon became little more than Celtic Muzak. This was of an entirely different sort, and was invigorating. It made me want to get up and dance. In fact one young woman came up beside the fiddler for a time and did a little jig while Mac Donnell played. Click on this Rankin sisters link to see them do a little step dancing themselves at the end of their song. Kolten MacDowell strikes a melodious set, but what I was most interested in what the rhythmic percussion brought in by his moving foot. 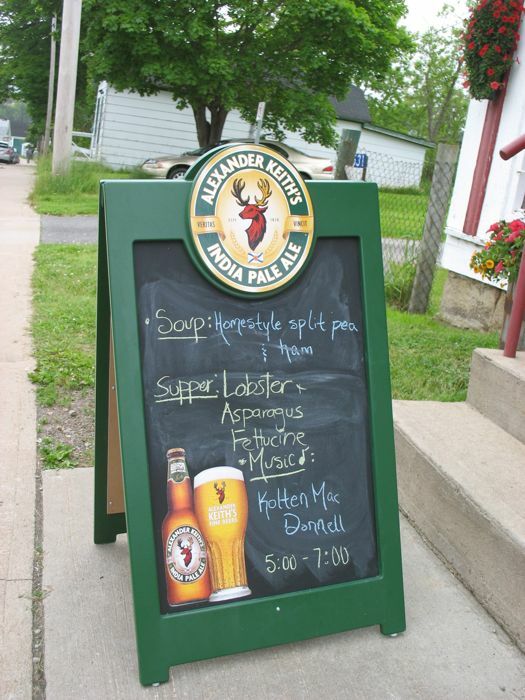 Recorded June 28, 2010 at the Red Shoe Pub in Mabou, Cape Breton, Canada. 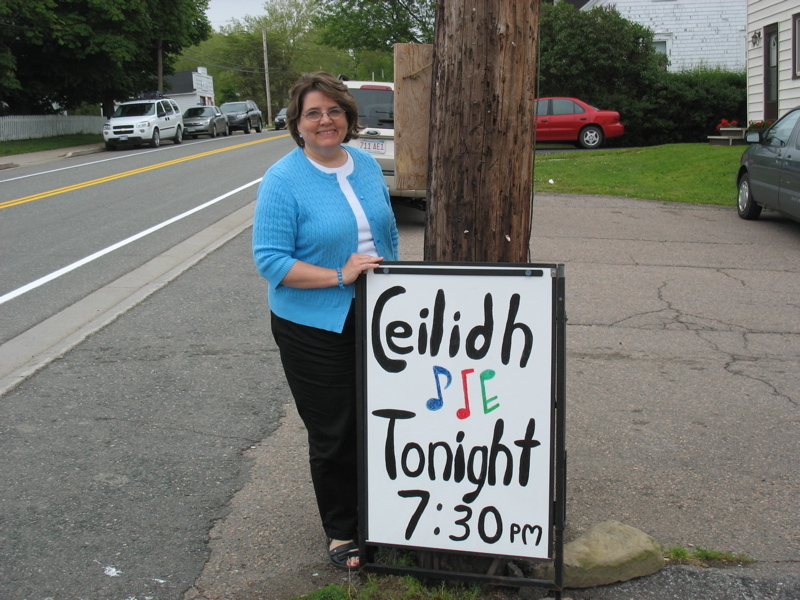 We ended the night at a local ceilidh (“KAY-lee”), where we heard three different fiddlers, two different pianists although not all at the same time and a 70-year-old gent perform some step dancing to the jigs. Splendid! 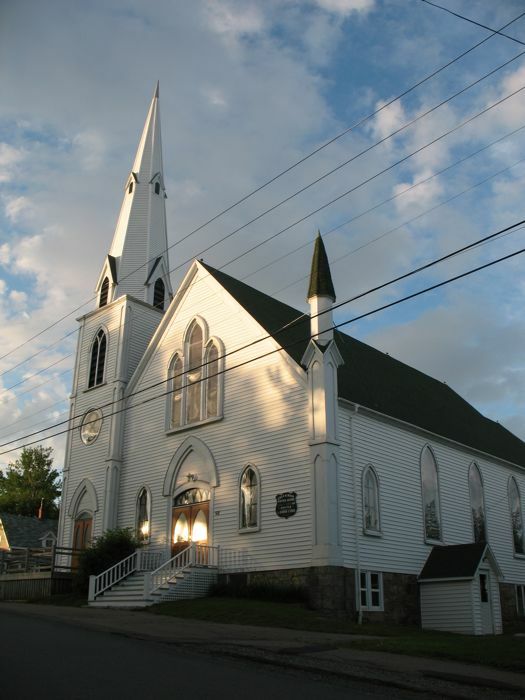 June 29th–We visited Mabou, Cape Breton, Nova Scotia and they had a Ceilidh there in the local church hall. This is a short clip of the event, with two fiddlers and pianist. The guest fiddler is Robert Deveau, and the pianist is Joey Beaton. Karen, Beaton’s wife is the other fiddler–they are all amazing. 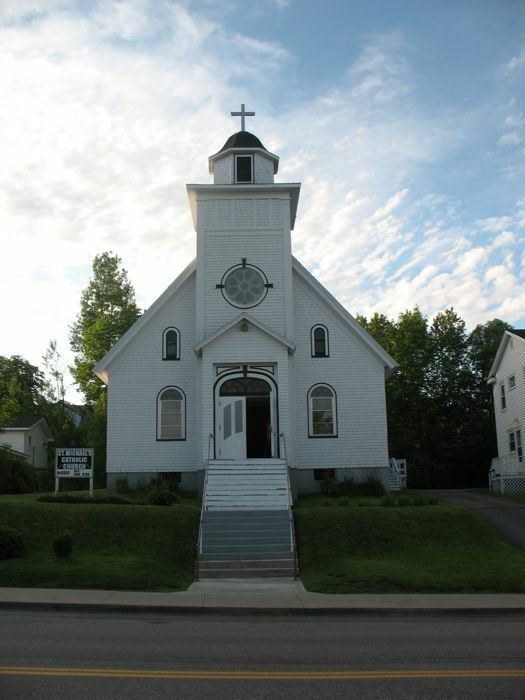 June 29th–We visited Mabou, Cape Breton, Nova Scotia and they had a Ceilidh there in the local church hall. This is a short clip of the event, with two fiddlers and pianist. 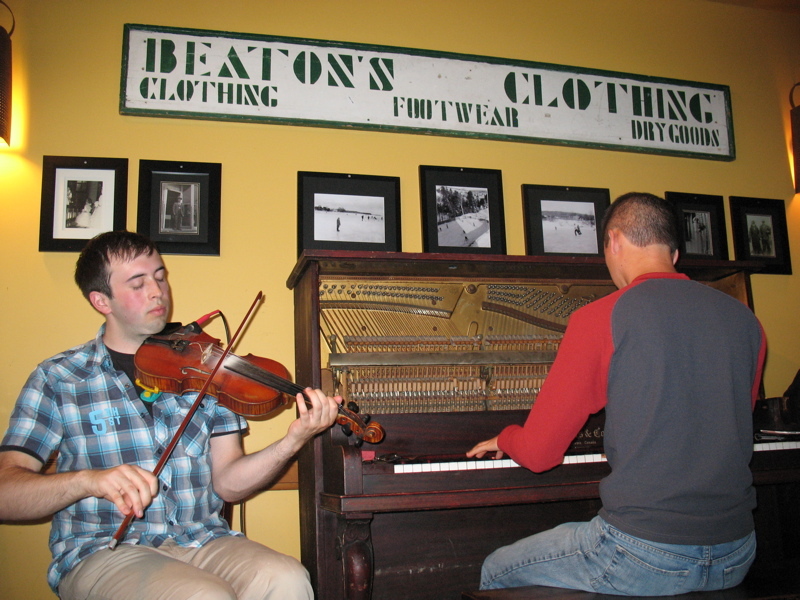 The guest fiddler is Robert Deveau, and the pianist is Joey Beaton. They called up a local resident, Harvey MacKinnon of Whycocomagh, Cape Breton to show us some step dancing. I wanted more and more of this as it was so entertaining, but instead we headed home to our little inn in the woods. Rain, lots of it, made for a wet and gray day. We ducked into a little shopping center just before the main highway, where we saw this sign for Takee Outee, as well as a grocery store AND a fabric shop. 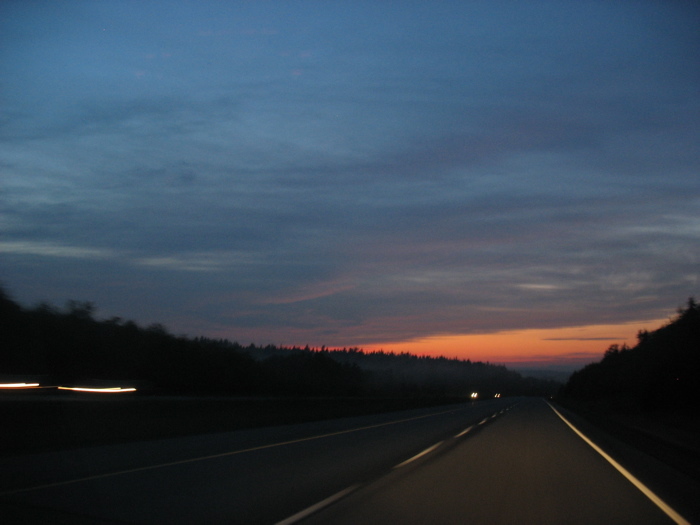 Then we traveled down the highway for a an hour or so, until we came to the end of Nova Scotia. 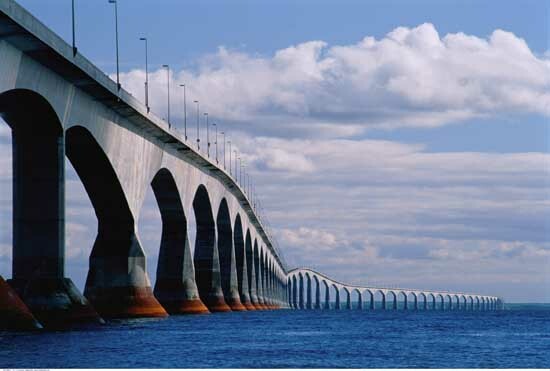 We traveled north through New Brunswick and then to the bridge over the Northumberland Strait. 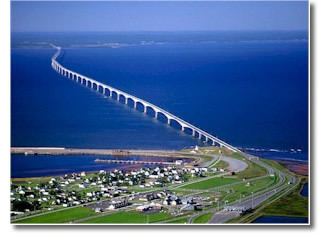 I had wanted to see what the Confederation Bridge–all eight miles of it–looked like as we crossed. 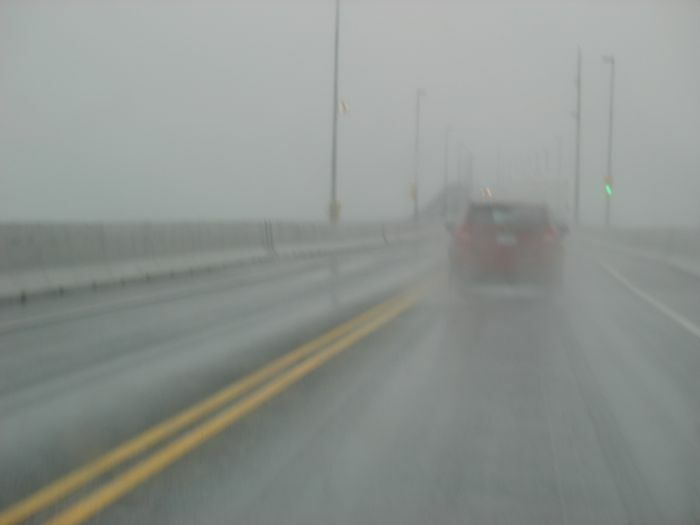 This is about all I saw: taillights of the car in front of us and gray falling drippy rain. They charge a two-axle car about $40 in tolls–but only when you leave. We paid ours in our ferry passage ticket the next morning. While I can see the need to help pay for public works, I think in the end, this toll acts as sort of a cinched-up rubber band on the economy of Prince Edward Island (PEI): who wants to go there for a weekend, or even a little afternoon shopping trip with a toll like that? However, if the citizens of PEI wanted to keep their island sequestered and free from intrusion from Too Many People, I think they’ve succeeded. We stopped at the well-developed-for-busses-from-Asia Tourist Information Center, complete with little shops, all hawking Anne merchandise, and we’re barely a 1/4 mile onto the island. The tourist lady got out her requisite orange marker (what is it with Tourist People and writing all over maps?) 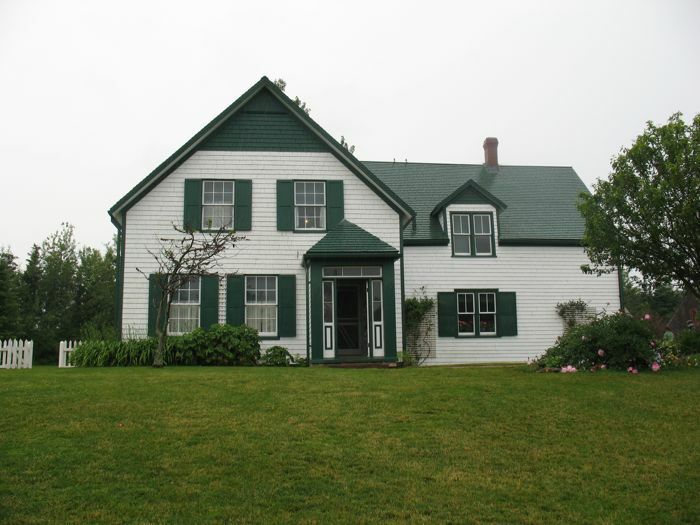 and drew the line from her place to Anne of Green Gables’ place. 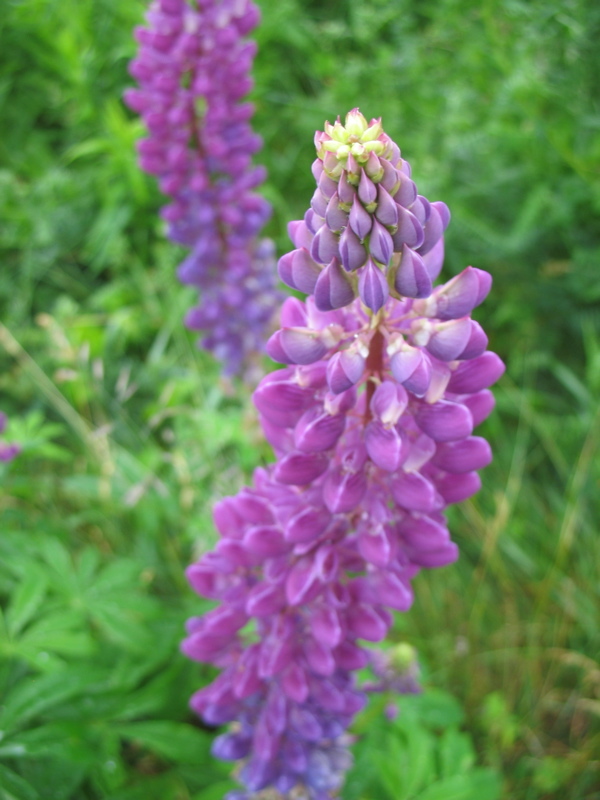 So we headed out into the rain, stopping only to photograph lupine, in their purple, pink, white and violet hues alongside most roadways, and stop for gas. 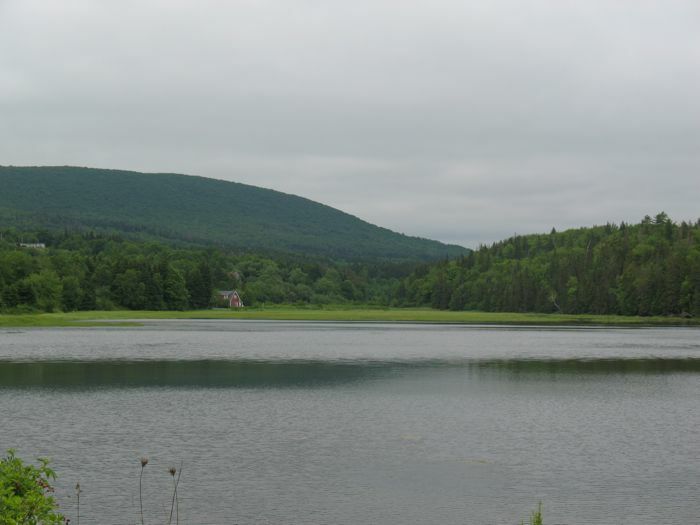 We stopped for lunch in New Glasgow–just off Routes 2 and 11, where the 258 intersects, just in case you want a good lunch with a beautiful view. We were treated to our first real taste of nice Canadians with the young server so helpful, although my lobster roll came out on a toasted bun (not requested) but it was still good. 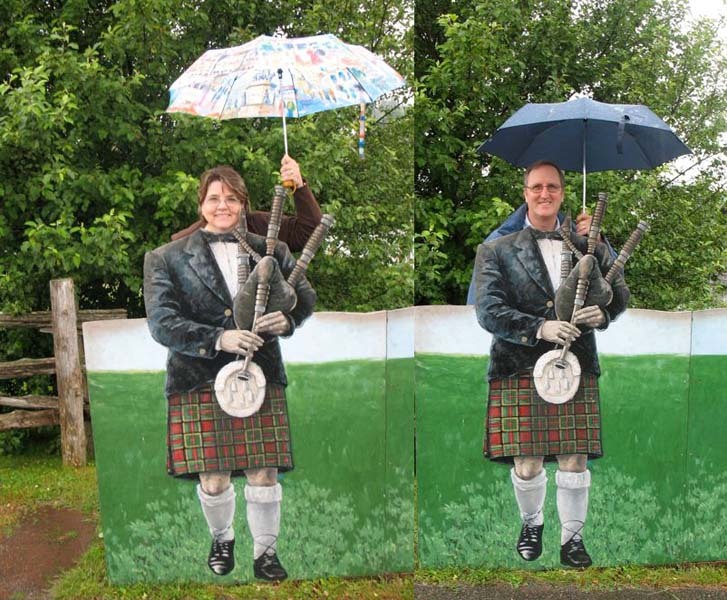 We posed outside; however, I think real bagpipers wouldn’t have umbrellas. Sometimes when I travel, it reminds of of many things I meant to be, but just haven’t become–like a gardener. 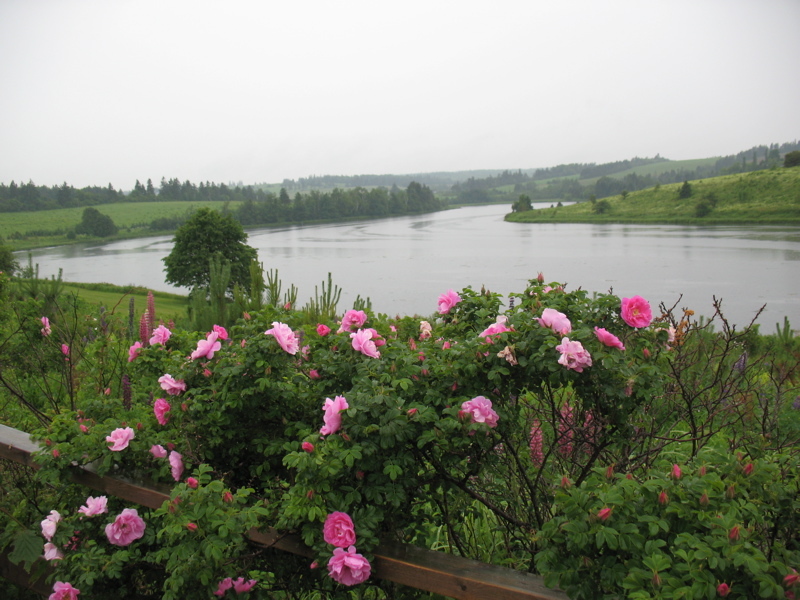 I meant to be a good gardener at home, but I doubt I’ll ever grown such luscious roses, dripping over a split rail fence. 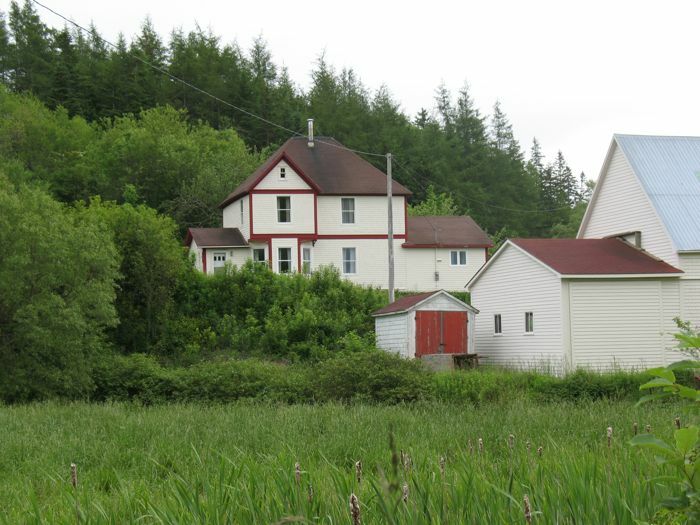 Another note to self: buy a house with a meandering river and an old church in the backyard. Mecca. We have arrived at Green Gables. It’s a lovely frame house and the grounds, barns and house are maintained by the National Parks Service, which makes it authentic and free from advertising (unlike the faux “Avonlea” next door). 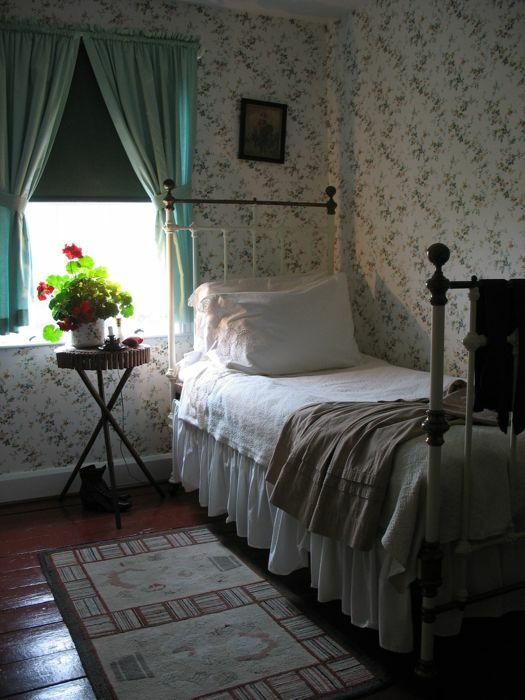 But I did find it interesting how firmly the fiction of the Anne of Green Gables books had taken root in visitors’ minds, with comments such as “Oh, this is where Matthew slept. 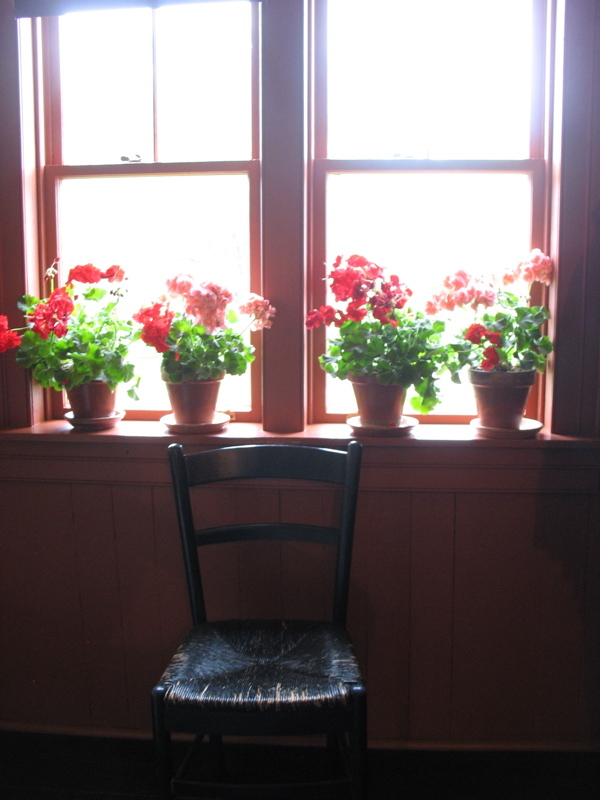 You know he couldn’t climb stairs.” and “This must be Anne’s room.” and “Where’s the little cupboard that held the raspberry cordial?” The author of the Anne of Green Gable books, Lucy Maud Montgomery, actually never lived here. 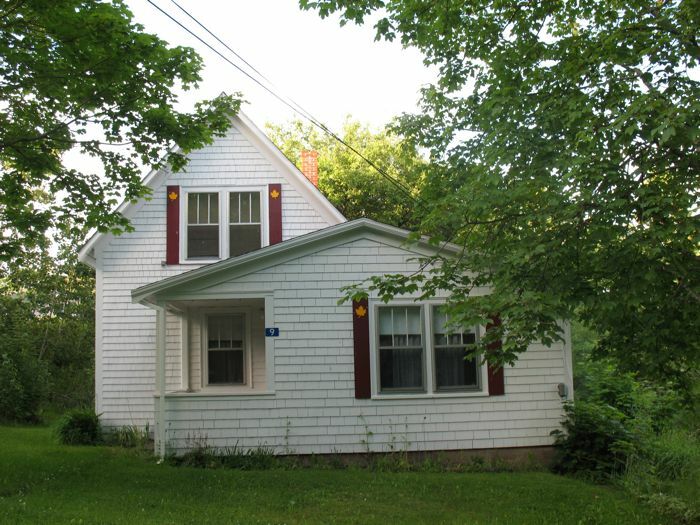 She was raised by her grandparents; her grandfather’s cousins (David and Margaret Macneil) lived in this house. 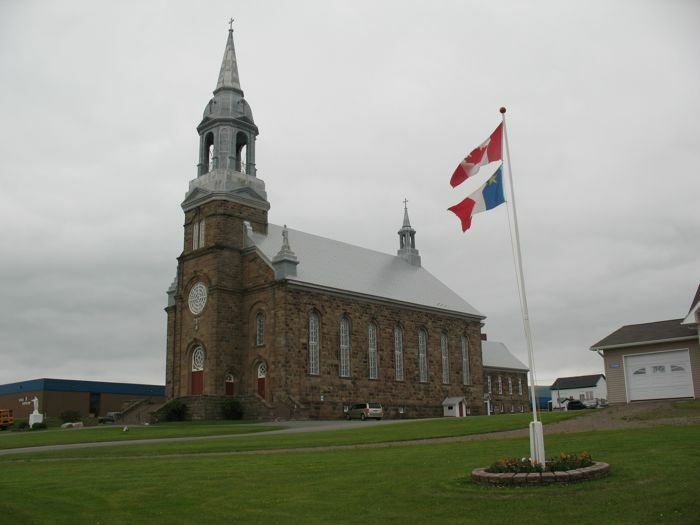 She did visit a lot, and Cavendish, this small town on the north side of Prince Edward Island that overlooks the Gulf of St. Lawrence was certainly her home. 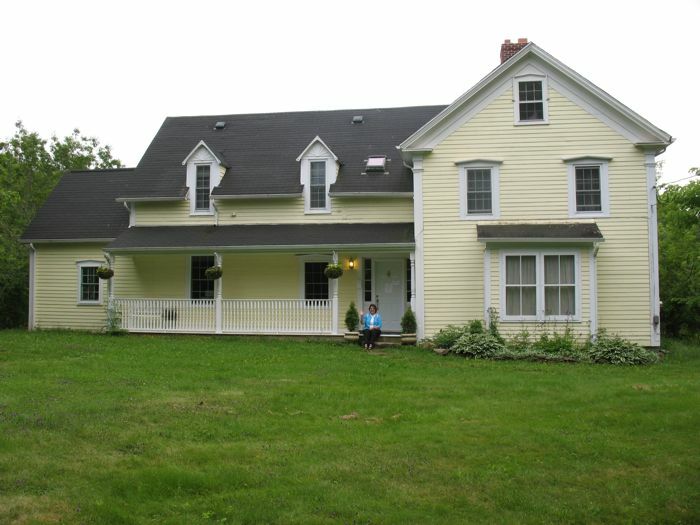 We didn’t visit her REAL home, the grandparents homestead, most likely because it was raining, raining, raining. I thought the Park Service had done a great job, in recreating the feeling of an early 1900’s home. 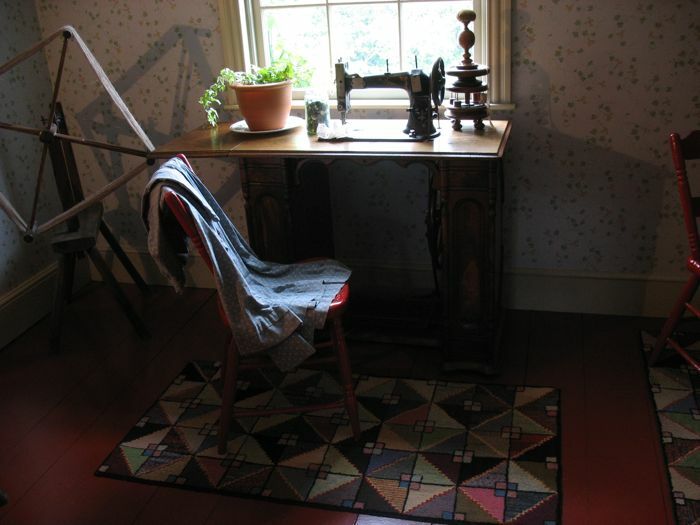 The hooked rug in the sewing room is a traditional craft for this area, with rugs this size going for $800 and more. 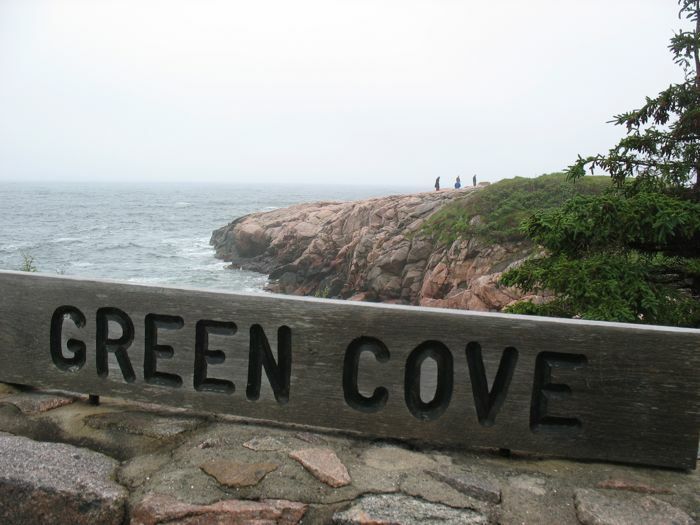 We saw a lot more on Cape Breton. 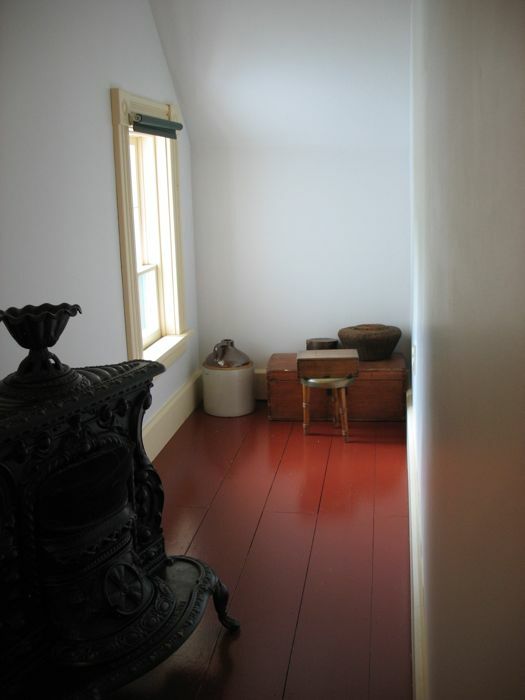 Grey skies do make for soft lighting on red-floored hallway landings. 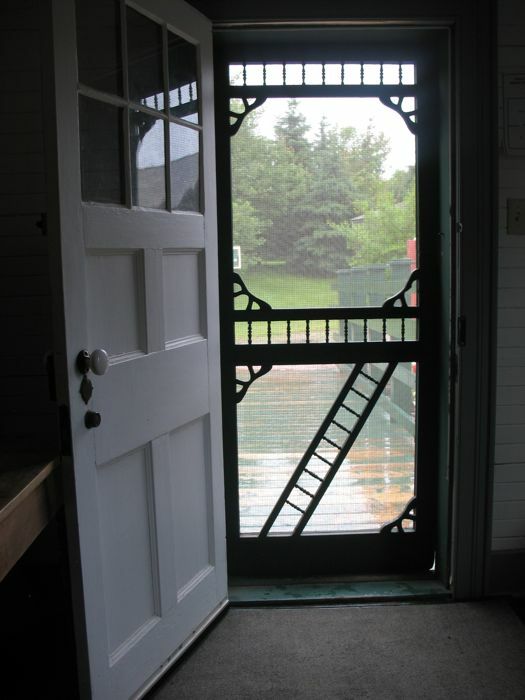 I wish screened doors like this were still around, but I can enjoy the look of it here. We headed out into the gardens, umbrellas aloft. The path over the bridge is so water-logged it needs its own bridge. I laughed when I saw this, as I had just watched the second series and in that, Anne chases the Jersey cow all around a cabbage patch, finally selling it off to Gilbert’s father on his way to market. Oops. 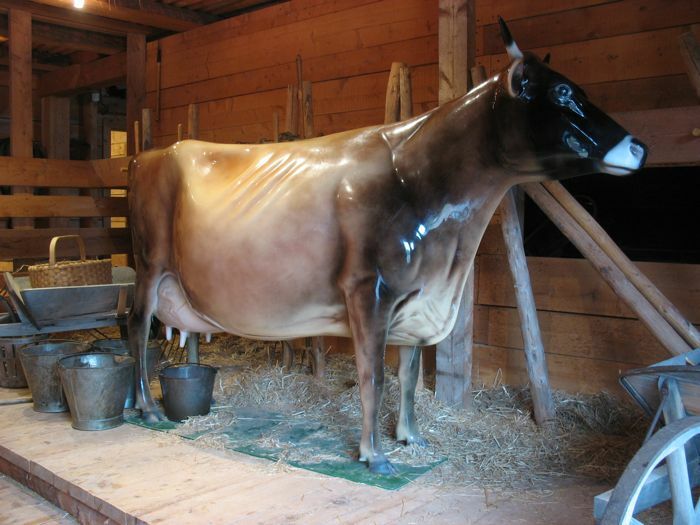 She sold the wrong cow, and had to pay $50 to reimburse their neighbor Rachel for the cow. Another friend who had gone to Green Gables the previous month told me that this site is really popular with Japanese tourists, as they study the book in their classes. Some Japanese brides even travel here to be married. Right as we were leaving, a large bus pulled up with an Asian tour guide. We did head next door to “Avonlea,” but after seeing the welcoming statue of “Anne” cast in resin, painted garishly (Made in China?) we passed. We also realized we had Far to Go to get across the island so we headed out along the coastal route 6, happy when the rain would let up and we’d get a bit of sunshine. On one such moment we decided to see our first lighthouse in North Rustica Harbour, as well as the neighboring buildings. Nearly perfectly colored yellow house against a nearly perfectly colored gray sky. Head to a later post about the lighthouses we saw–and the ones we glimpsed from across the water. 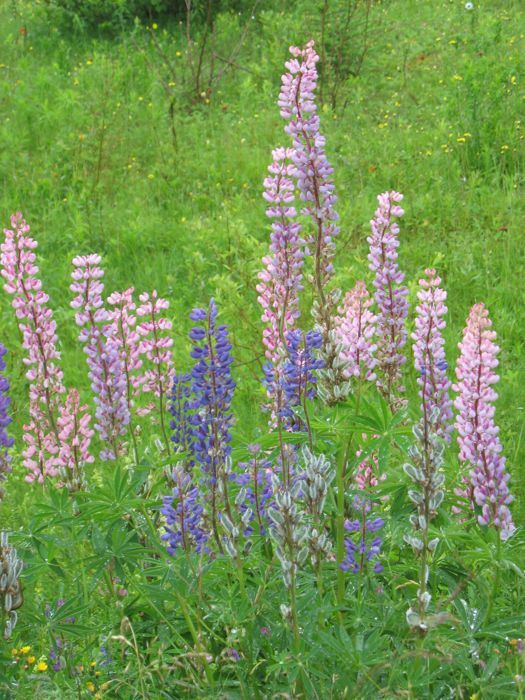 We stopped at a gift shop selling PEI pottery and woodworking items, but I was more entranced with the lupine in the front gardens. One interesting thing about these flowers is their supple stems, curving to the left, and then to right. I actually saw some lupine seeds for sale in one of the gift shops, but realized that they’d never grow in our semi-arid desert city. So many of the flowers we saw here I loved (oh, the peonies! 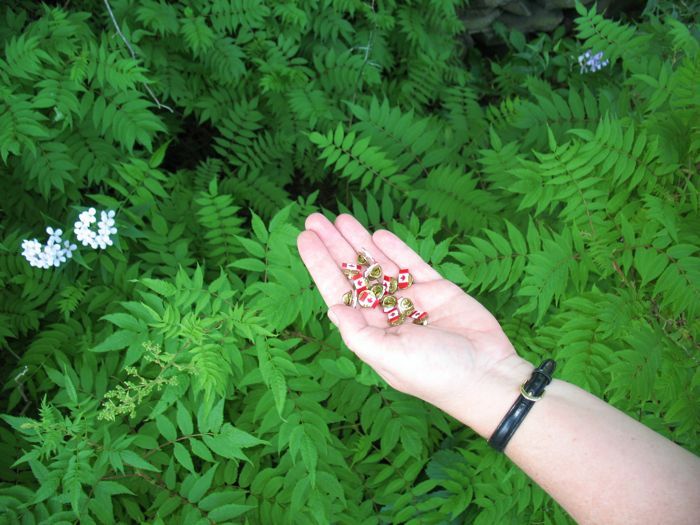 ), but realized they needed this type of climate to thrive, survive. 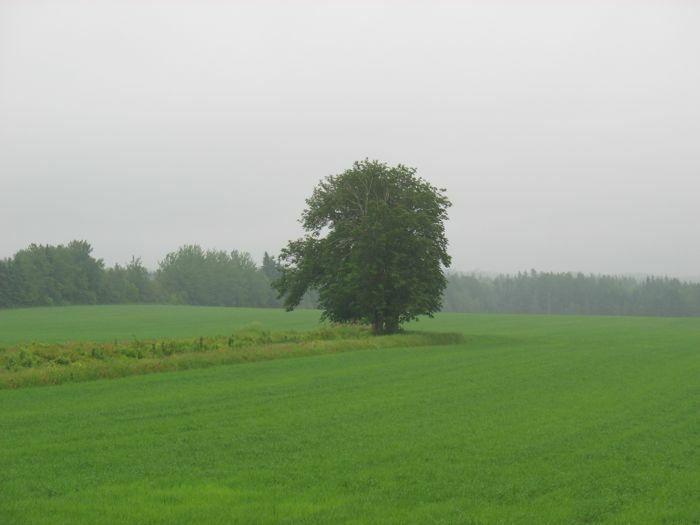 On the way to Georgetown, we saw this lone tree in a green field. It reminded us of England’s Yorkshire region. We made it to Georgetown, which on the tourist map is printed in bold letters, indicating a major town. If this is a major town, I don’t think I’ll find much at the other non-bolded towns. 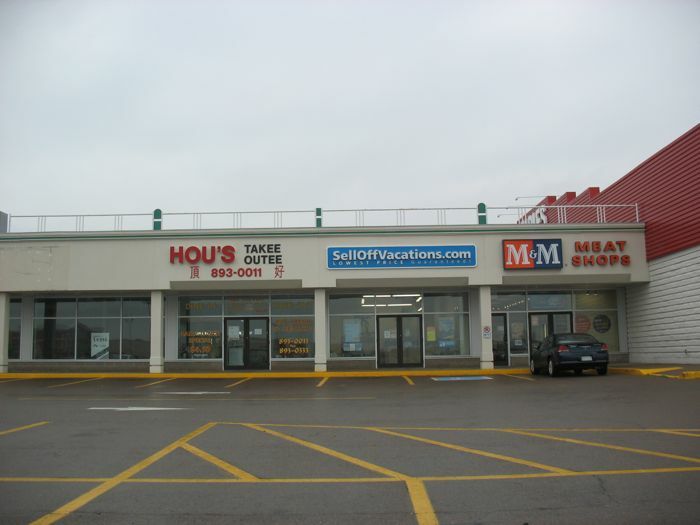 We drove the six blocks of this place, and couldn’t figure out where our bed and breakfast was. So we drove back through. Repeat, but this time, take a wild turn because on one of the tourist maps, we see what we think is the street name and yes, after driving a mile or so, it is. The night is falling, so it’s more gray than ever. We drive down the driveway to where we’d booked our night’s lodging, but we both kind of felt like, this is it? It was lovely on a tree-filled property, but something about it kind of said: depressed. This was the one lodging that we’d had to pay in advance, otherwise I’m sure we would have backed out of the driveway and looked for something else. Only, having just driven through Georgetown, we knew there wasn’t anything else (or at least that we could see). Dave figured out later that we were the only paying guests that they had booked that week. 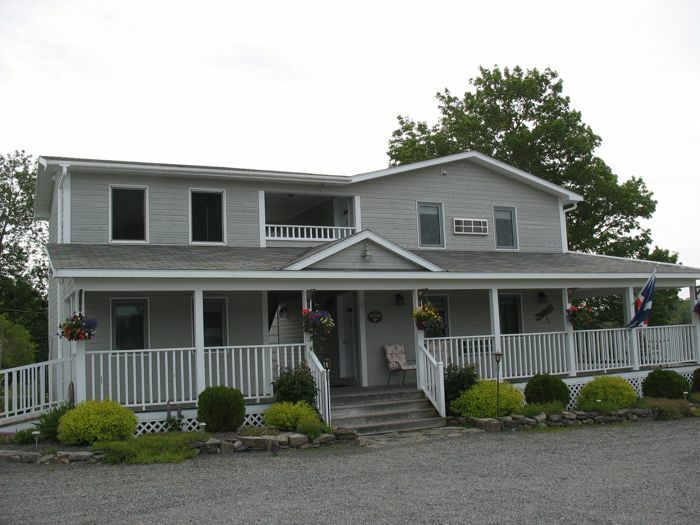 It was called the Romany Rest, and the innkeepers were British, but having grown tired of the rat race in Britain, they immigrated to Canada to run a bed and breakfast (sound familiar?). They also wanted more property, and had already purchased 25 acres on the west side of the island, but they couldn’t sell this place in order to head over there (we did notice the real estate sign as we drove in–there were a LOT of real estate signs everywhere around here). Our bedroom was mostly lovely, but exceedingly stuffed with stuff. Stuff on the nightstands, in the bathroom, on the chairs and dresser, stuff on the beds. 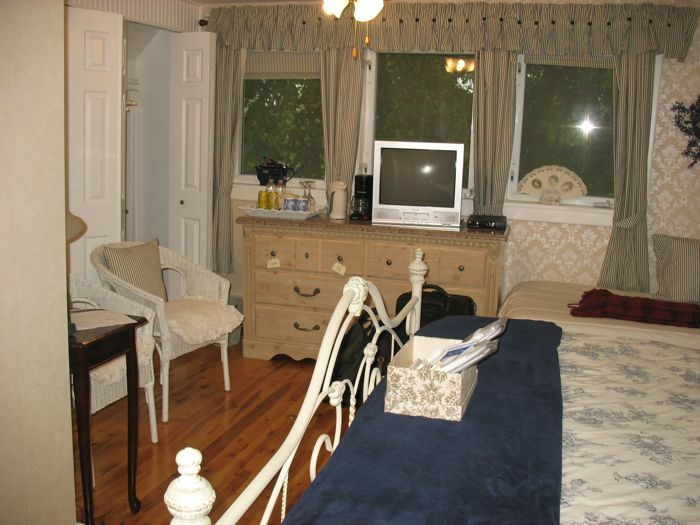 Note to innkeepers: leave room for the tourist’s stuff. Dinner? Back to Georgetown, to a place called Clam Diggers. Depressed. The restaurant was sparsely populated, food was okay, but overpriced. We began to wonder what the deal was with PEI at this point. Admittedly we’d stumbled out past civilization (we realized we should have booked in Charlottetown), but everything felt like a mining town just after the mine owners had shut down the mines. Very little commerce, no traffic, no shops open even when we’d come through earlier in the evening, just a place with no economic action. 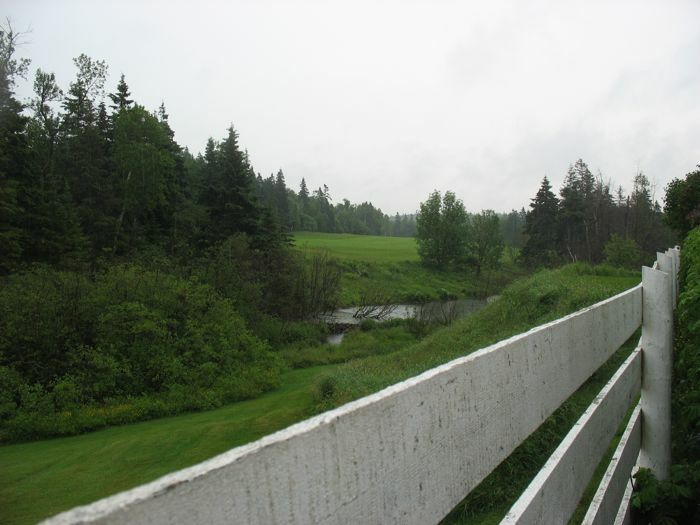 While the areas around Green Gables were flourishing apparently because of large busloads of Japanese and American tourists, that bounty was not reaching past the Green Gables epicenter. After dinner we stopped at the only store we saw in order to satisfy my chocolate craving. It would remain unsatisfied, as the store was also “depressed.” Half the refrigeration cases were either broken or they had no reason to fill them up, the area near the register had the usual assortment of pre-packed boxes of candy and trinkets, and the rest was sparsely filled. Back to our Bed and Breakfast to try and make a go of it. The bed was good, the pillows were mediocre (funny how much you can miss that old pillow at home when you’re traveling), the room stuffy and the hallway light was brightly lit all night. 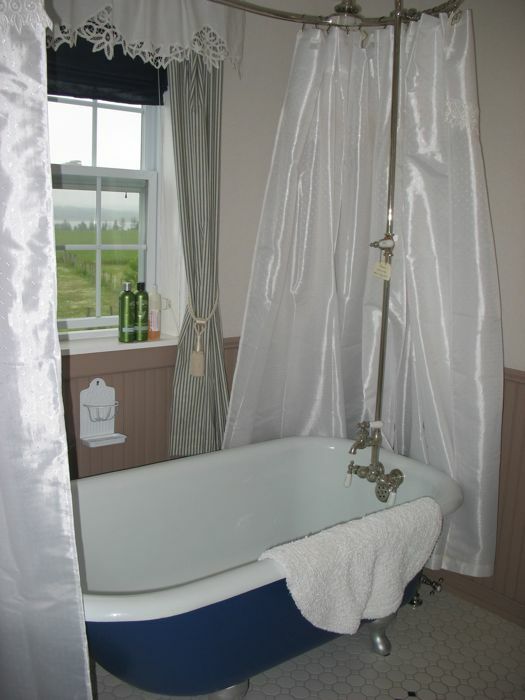 I was happy to get up and get down to breakfast the next morning, but first I had to face the old-fashioned shower, with its three shower curtains. 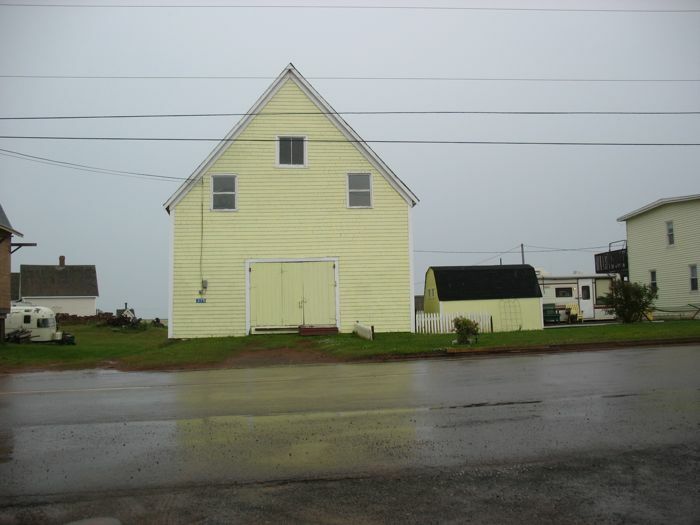 While there was nothing I could put my finger on, I just felt like I was in a depressed house, with a depressed host (confirmed at breakfast, although she was really nice), in a depressed part of PEI. No wonder they’re giving preferential immigration status to those who will move here and build up the economy (which is why these folks bought the place). 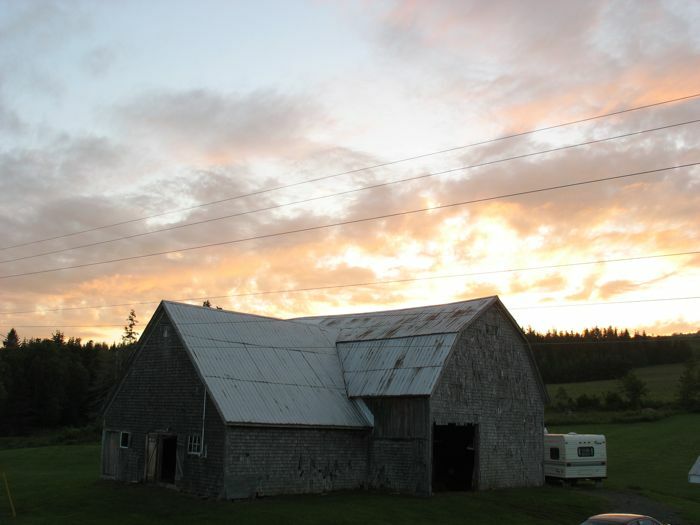 But now these folks wanted to go “back to the land” and live “green” with a wood-burning stove (we heard all about it at breakfast) in a small place with lots of acreage. When I purchased the ferry tickets online the night before (her suggestion and very nice of her to let me use her printer and computer), I opted for a 9:30 a.m. sailing. Dave wondered if we shouldn’t go later, but in the end, he was also glad to get off the island. 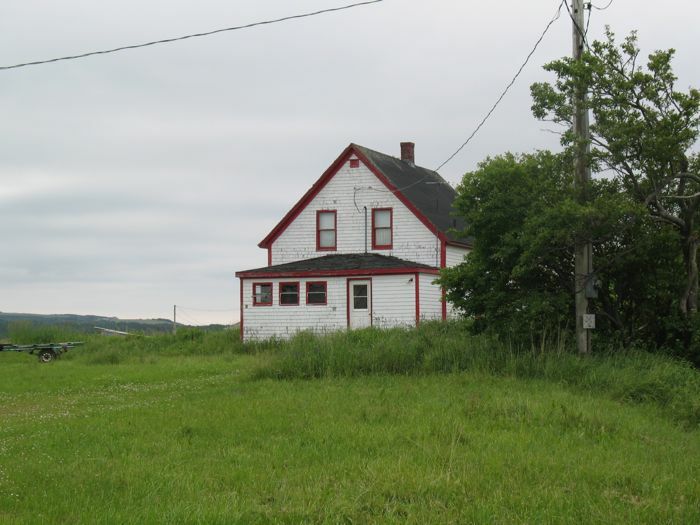 Prince Edward Island–a place I’d heard about all my life, read about, and now I wanted to go nearly as soon as I’d arrived. It was a curious feeling, and I felt bad about it. 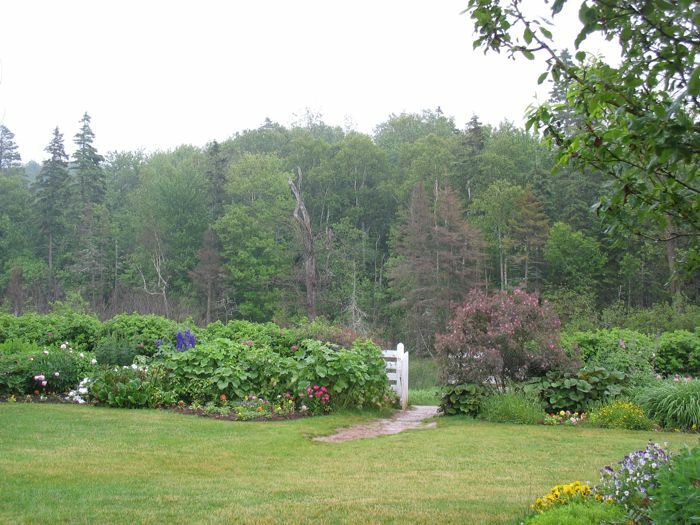 But in spite of Green Gables’ charm, the lovely scenery and beautiful gardens, I was ready to go back to the “mainland”–back to Nova Scotia. We arrived in Halifax tonight at 8:30 p.m., which is 4:30 p.m. our time, which is exactly 11 hours and 45 minutes after we woke up with a start in Riverside and realized that the alarm didn’t go off and wow, we’d better really hustle and in spite of the Giant Rush out the door (forgetting only the most minor of things, like hairspray) we made it to LAX in record time. Flight One, from LAX to Toronto was fine, uneventful and I have to give Air Canada full stars for decent seat-rest entertainment screen (plus a plug if you needed it), but about a C- on food. Luckily I’d brought ours. We made our connection to Halifax, easy two-hour flight, did the car rental thing then tried to find a quick bite to eat. Apparently the only place the car rental girl knew about closeby was Tim Hortons. This is like a combination of Dunkin’ Donuts and Subway and they are everywhere. We’d never seen one, though, so every question the girl at the counter asked us, we had to think about. The one question we would get over and over in Canada was “Would you like that toasted?” and its cousin, “Would you like that grilled?” I can only think that when Canadians hit America they must think we never toast our food. We do. It’s at breakfast and we call it, um, toast. I do have to say, that I actually grew to like a lot of my fast food toasted (yes, we ate at Tim Hortons more than once) and will miss that option once I return home. 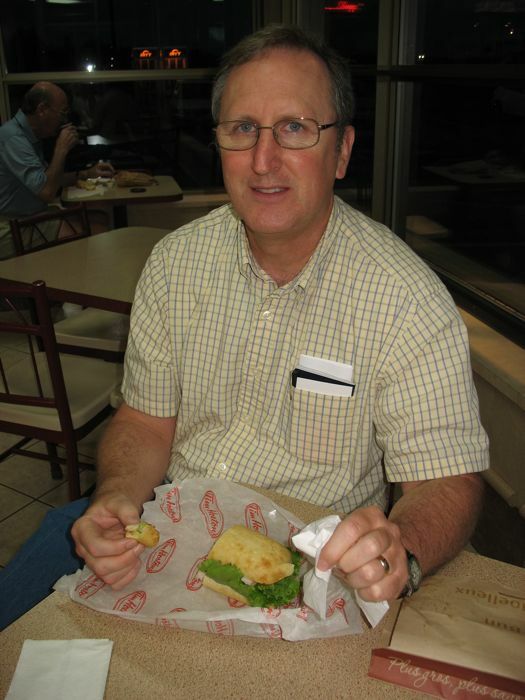 By the way, Dave had the winning sandwich of our two orders (we always choose a winner and a not-winner). We then drove on to Bible Hill, just outside Truro, only having to turn around once because I left all the directions to our B&Bs home on the computer. We meet our host (he waited up for us–so nice!) and go to our small, yet spacious room under the eaves where we use our wireless to check the weather: it’s supposed to rain most of the time tomorrow while we’re driving around seeing sights. This is the front of our Bed and Breakfast, The Baker’s Chest (I took these the next morning). It’s run by a couple who were tired of the rat race in Holland, looked around for a business to run, and decided to immigrate to Canada and run this place. The first year they were here they also ran a tea room, serving lunches, catering to weddings and the like, but about killed themselves off doing both. Now the tea room is available for special occasions. They still do weddings. 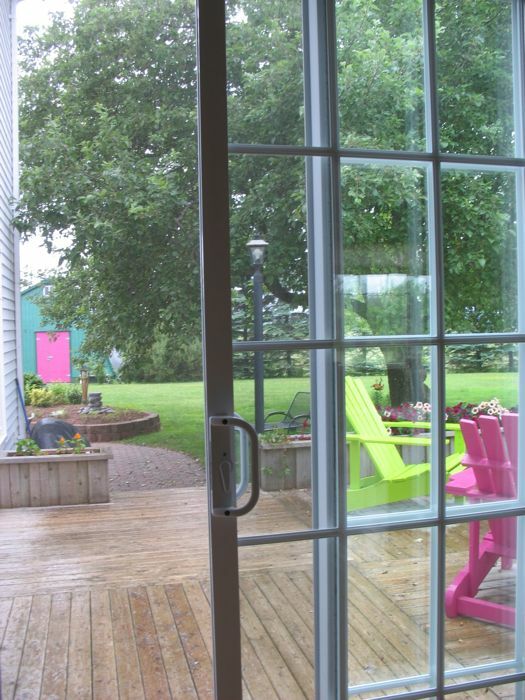 This is the view out the family room area to the backyard; I love those brightly painted chairs. After watching this winter’s Olympics, don’t we all have that song engraved in our memory? We’re off on another trip this week–this time to Canada. 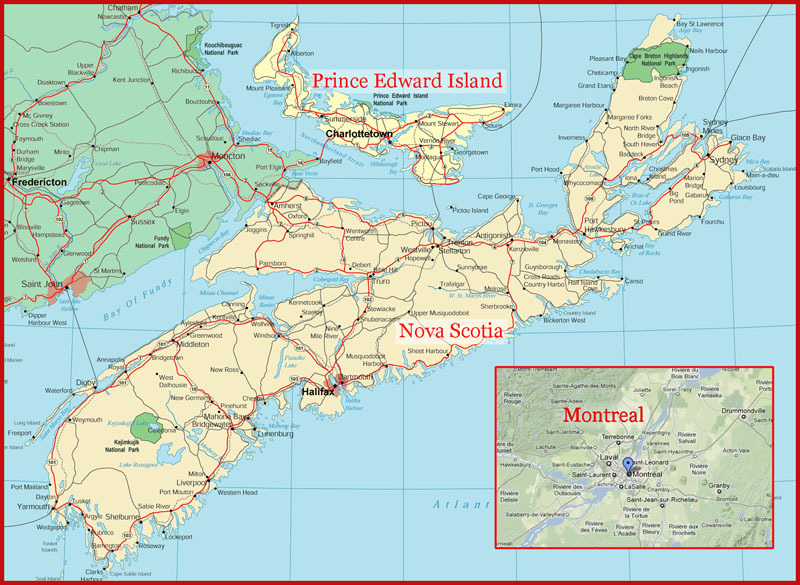 First stop is Nova Scotia, then Prince Edward Island, then back to travel Nova Scotia and the Cabot Trail before spending a couple of days in Halifax and then on to Montreal. I checked the weather report–lots of rain. 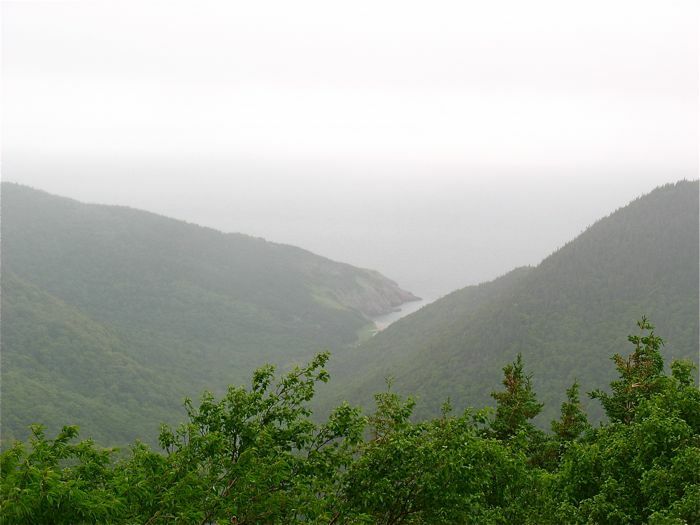 Dave cheerfully noted “That’s why it’s so green!” I don’t mind the rain–just hopefully not too much on the day we want to drive the Cabot Trail. A note about this blog: My son Peter has helped me rework and tweak a few things on this blog, so it’s finally getting where I want it to be. It has a static opening page (that of the heart-shaped map), and the navigation is done through tabs at the top of the page. To read the latest blog post, head to “Blog.” But if you just want a certain country, or trip, click on that tab. Most of them are finished, and obviously there’s not much on the Canada tab, as it hasn’t happened yet. “He who has seen one cathedral ten times has seen something; he who has seen ten cathedrals once has seen but little; and he who has spent half an hour in each of a hundred cathedrals has seen nothing at all.” – Sinclair Lewis, on sightseeing.